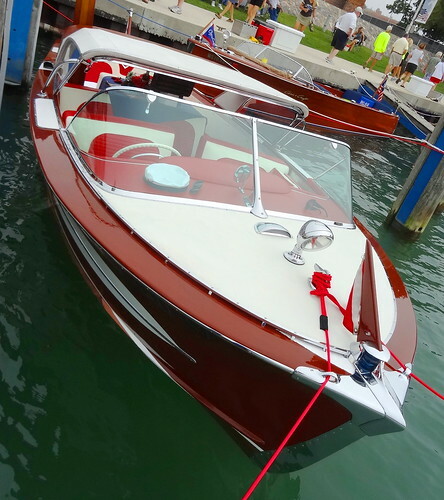 The Michigan chapter of the Antique and Classic Boat Society is hosting the 2018 ACBS International Boat Show on the Black River in Port Huron. 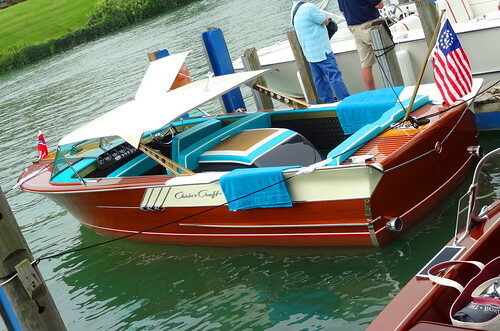 Participants began arriving earlier in the week; group activities and tours through the St Clair Flats show people around the Blue Water Region, guides tell visitors about the amazing local boating history and legendary men Christopher Smith and Gar Wood. 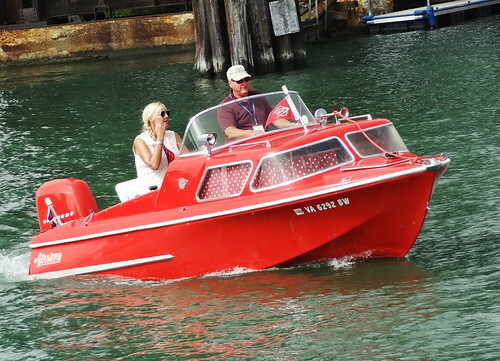 Boaters, collectors and curious people from the United States and Canada are gathered along the length of River Street Marina, nearly 200 boats have made the trek and are on display for the public. We arrive early in the day, fog hangs low, I hope it burns off soon. A stairway leads us down to the river bank, we start at the 10th Street bridge, looking ahead we can see boats double and triple parked all the way to the Erie Street bridge, crowds of people mingle along the sidewalk, excited visitors wearing orange life jackets line up for a free ride on a classic boat. 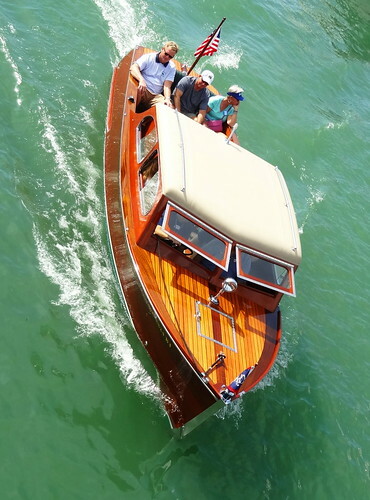 We don’t own a classic boat, it’s the beauty, styling and craftsmanship that brings us here today. 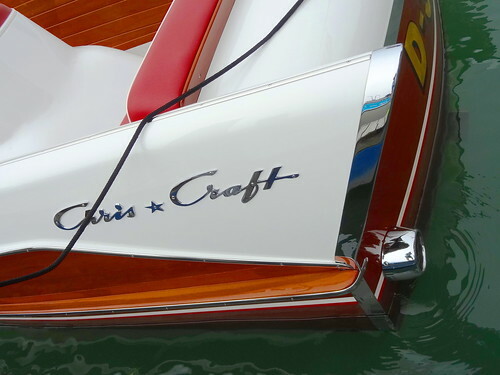 Chris Craft outnumbers brands such as Lyman, Century, Higgins, Larson, Gar Wood; each one unique and eye-catching. Mahogany, Teak, chrome, red is a popular interior color, signs are on display listing the brand, size, motor and owner’s name. The humidity is high, the fog beginning to lift as we proceed down the river. 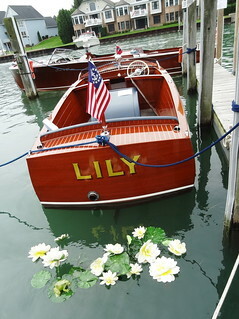 Some owners go to great lengths with their displays; Lily has her own lily pads, “Rhubarb” is here all the way from Washington State with lots of pretty little rhubarb details, tables are set, picnic baskets are filled with goodies, antique water skis are ready to go. 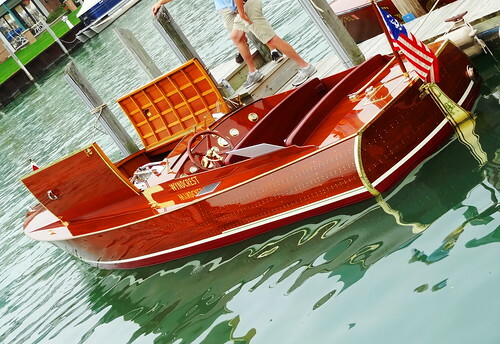 Boat designs reflect the automobiles of the time; steering wheels, big chrome emblems, dashboards filled with gauges, knobs and levers, tinted windshields, chrome exhaust tips. 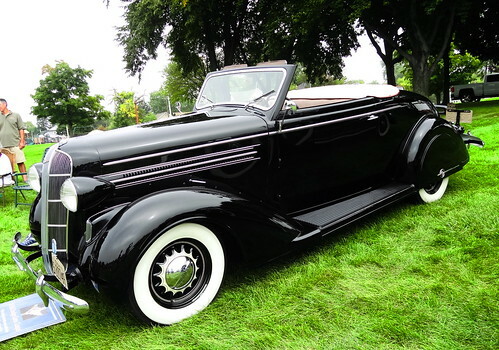 Engine compartments are open, men on docks stand and stare, fiberglass bodies are designed like automotive fins, wide stripes, bright colors, so cool! 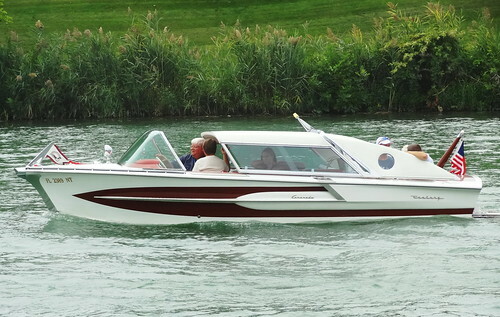 All shapes and sizes are present; cruisers, runabouts, classic launch and utility. 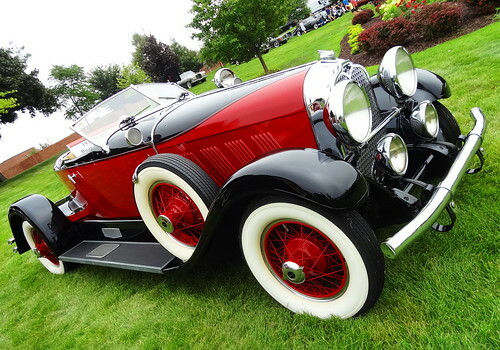 The Higgins is a showstopper in red and white, I love the wrap-around windshield. 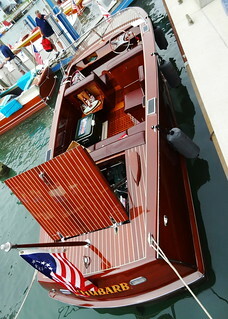 The two-toned Chris Craft looks sweet with a red interior, I’m liking the wooden boats with the black-painted sides too. 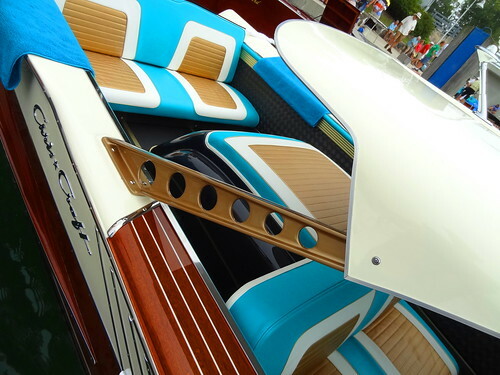 Kris’s favorite so far is the 21′ 1961 Chris Craft Continental with a Lincoln 275 hp motor, it’s fabulous in turquoise, gold seat inserts and funky roof supports, it screams 1960’s. A pair of silver boats are tied to a dock, they look like something Batman would drive. I’m surprised how many boats have multiple levels, I can only imagine the view from the top. The woodwork and attention to detail is exceptional, everything was thoughtfully designed, beauty was as important as function. 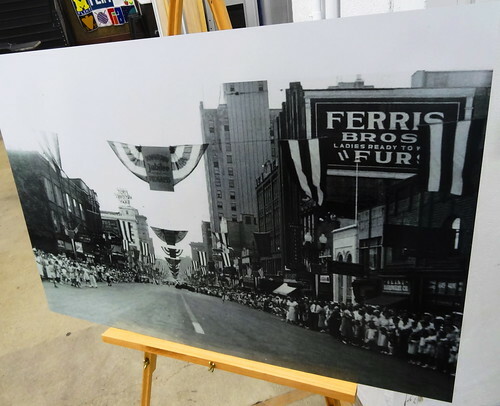 Restoration photos always blow my mind, the time and effort put in can only be described as a labor of love. My favorite photos are the ones of the father and son, brothers, best buddies, arms around each others back, wide grins, standing in front of the finished project. 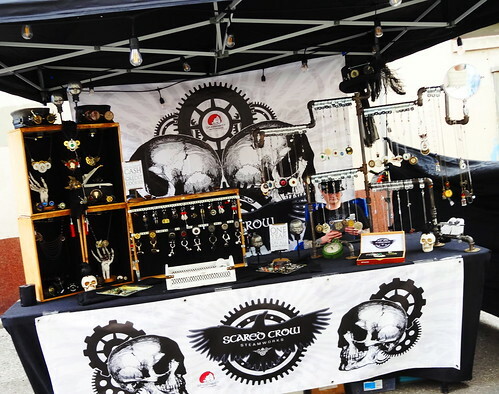 Vendors are set up on the grass, they come from all over to sell boat-centric items from jewelry and clothing to wax and ACBS souvenirs. 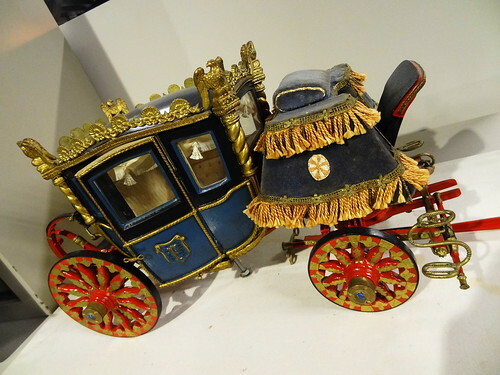 The most adorable boat wagons I’ve ever seen, ok, the only ones I’ve ever seen, are for sale along with rocking horse boats and wooden boat hats, all very clever. We climb up the stairs pausing on the bridge, here we have a great view of the show, a whole different visual perspective of the boats, a gorgeous sight. 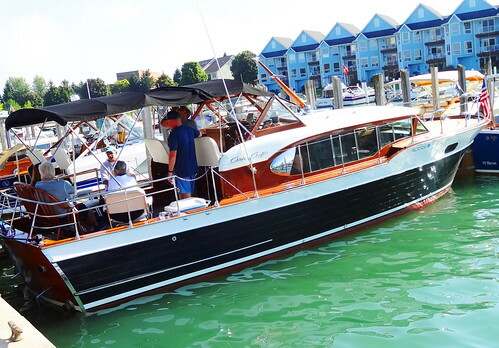 Following the Black River we end up at the mouth where it joins the St Clair River, boats are filled with passengers coming and going, all enjoying the deep blue water and now sunny sky. Freighters pass in the distance, a little red boat with polka dot curtains looks minuscule in comparison. 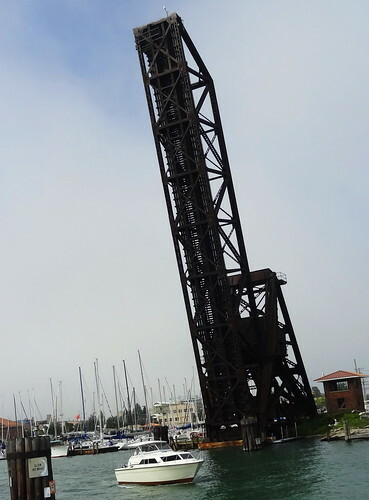 The old railroad bridge still reaches straight up, it’s become a bit of an icon, a landmark, I hope they never get rid of it. Walking back through the show we stop at several boats to get a closer look, some of the cruisers are open to the public to come aboard. This time I notice the steering wheel of Wilgold is on the left like a car. I ask around and learn that boat propellers turn clockwise. 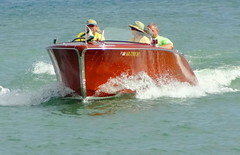 Hulls used to be designed in such a way that when there was torque on the prop the right side of the boat would rise up. 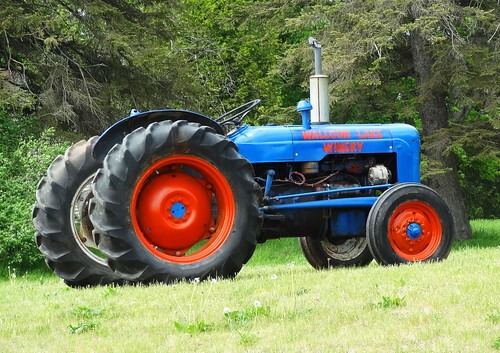 The steering wheel was put on the right so the weight of the driver would counteract that. 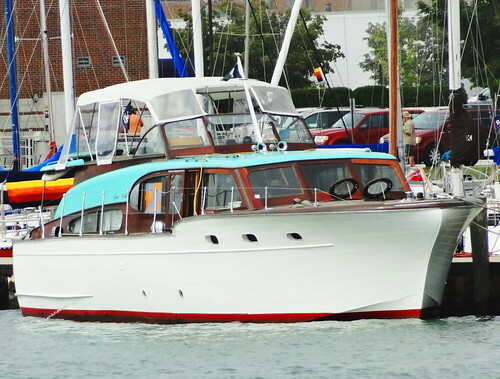 Modern hulls don’t have that problem but the design stuck. 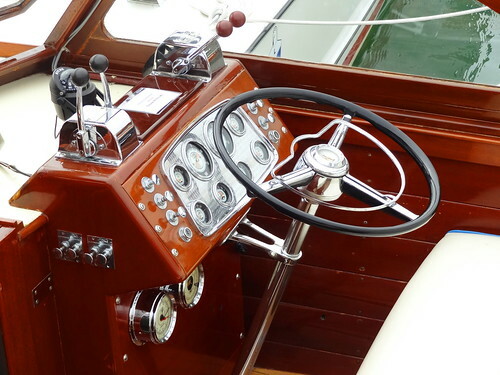 Most racing boats have the steering wheel on the left. 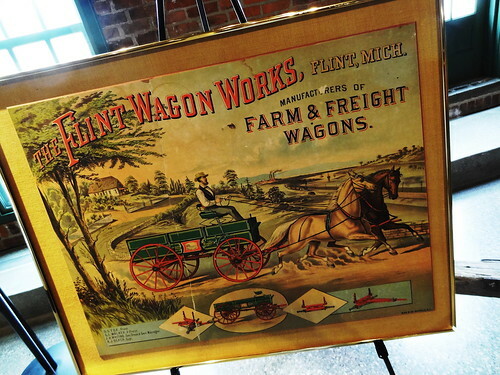 A trailer contains a Lyman display, photos show the old factory in its glory days in Sandusky OH. We actually stopped in that building last summer. 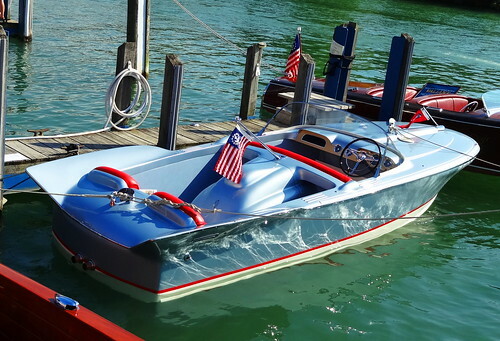 It’s now event space but the owners have kept a bit of the Lyman heritage alive with boats and memorabilia. Back at 10th Street we climb the hill towards the parking lot. 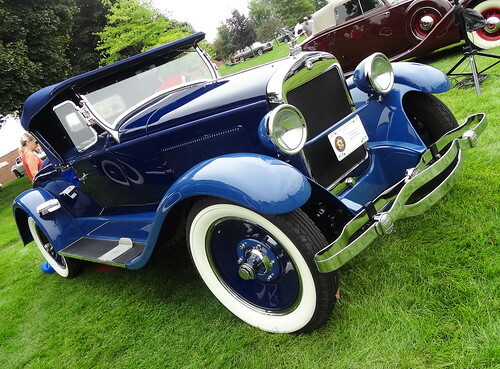 A group of antique cars are on display for the festivities. 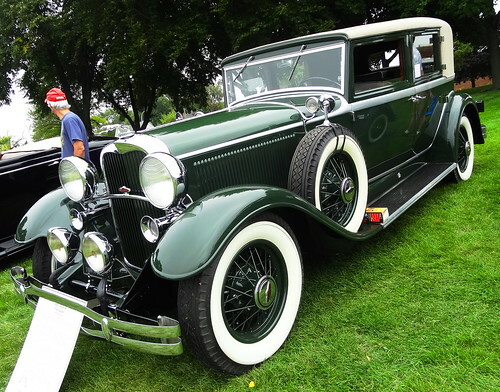 Packards, Pierce Arrow, Lincoln, Auburn (a boattail of course) and even a Wills Sainte Clair join the gathering. Ernest Camera Shop has a vehicle here with antique reproduction Kodak advertising on it, looks great. Time to get some food, it has turned into a perfect September day, waterside dining is a must. 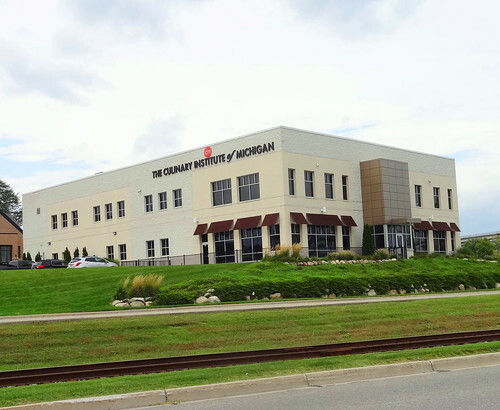 Courses is located in the Culinary Institute of Michigan, part of the Baker College system. Students get world-class training in baking and pastry, culinary arts, food and beverage management. Students learn the art and business side of the food service industry. 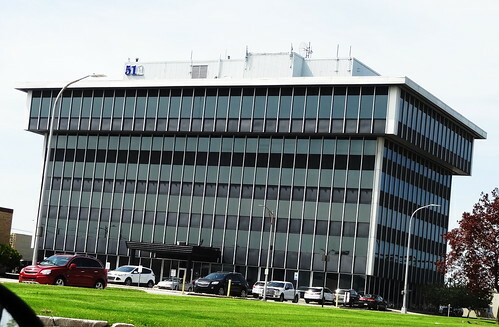 The building sits on a grassy hill next to the old Thomas Edison Inn, now the Double Tree Hotel, overlooking the St Clair River, Canada and the Blue Water Bridge–how’s that for scenery? Students are the hosts, servers, bartenders and chefs. A tv above the bar allows you to watch the students at work in the kitchen. There’s an open table right in front of the windows, perfect, we are greeted quickly, given menus and water. Our server arrives with the signature bread basket, takes our order and heads to the kitchen. We satisfy our hunger with pretzel rolls, cranberry bread, bread sticks and sweet muffins topped with blue cheese. The food arrives and we dig in without hesitation. 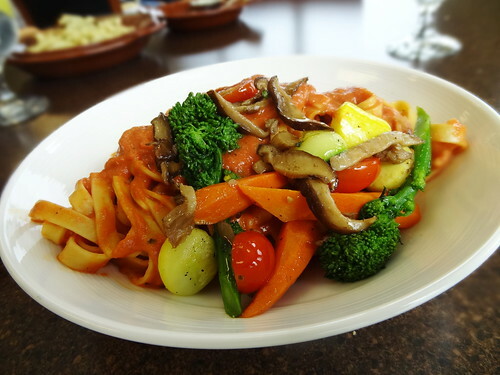 I’m having today’s pasta which is fettuccine with a vodka sauce topped with roasted vegetables, it’s wonderful. 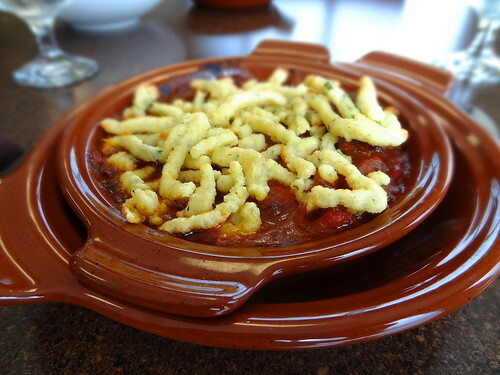 Kris has the German stew, tender chunks of meat in a rich smoky sauce with peppers and onions topped with spaetzle, very good. Courses is open Wed-Fri from 11:30 – 2:00 when classes are in session. Check the website before you come, a reservation is never a bad idea. 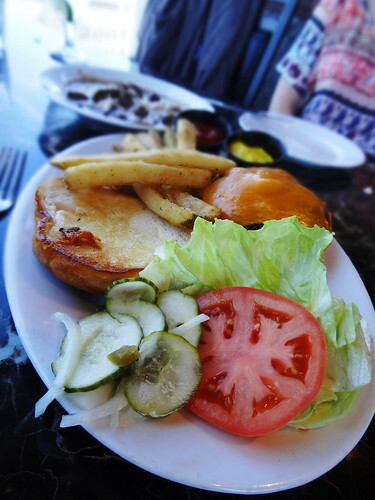 The food is delicious, prices are fair and the view is unbeatable. This year Metamora Hunt is celebrating its 90th year. 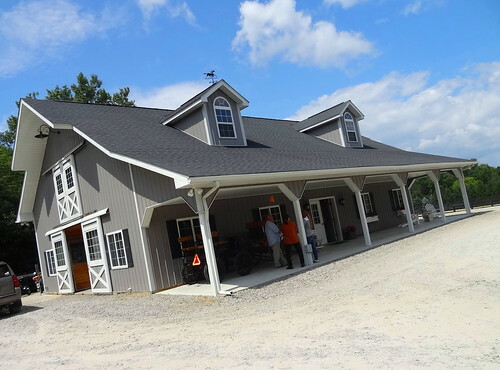 We’re here for the 10th Annual Hunt Country Stable Tour, a self-guided tour that allows participants an up-close, personal visit to 6 area farms. 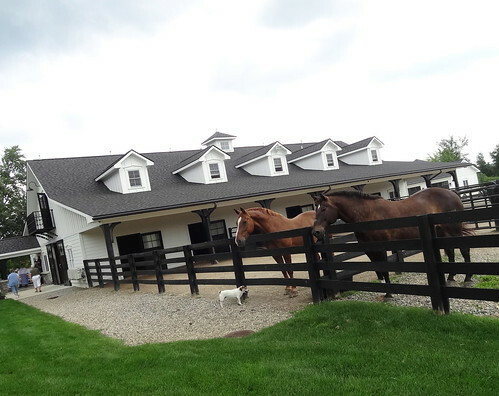 Metamora Hunt Country is the area from Ray Rd to Sutton Rd and Metamora Rd to Havens Rd; proceeds from the tour go toward maintaining the bridle paths. We start at the Hunt Kennels on Barber Rd where we purchase tickets and pick up our maps; the first stable is just down the road. 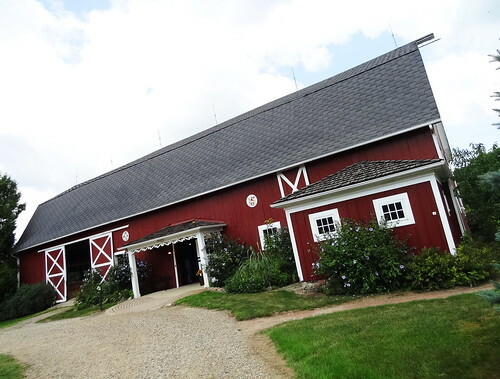 Red House Farm was established in the 1880’s by the Morse family, the current owner added a horse stable and a smokehouse. As soon as we arrive we see the namesake Red House trimmed in white, porches are adorned with fancy spindles and trim, seasonal wreaths hang on the doors. 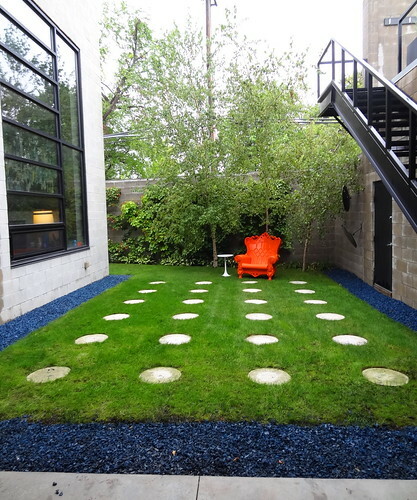 The in-ground pool behind the house surprises us, it’s so inviting it’s hard not to be tempted to dive in. 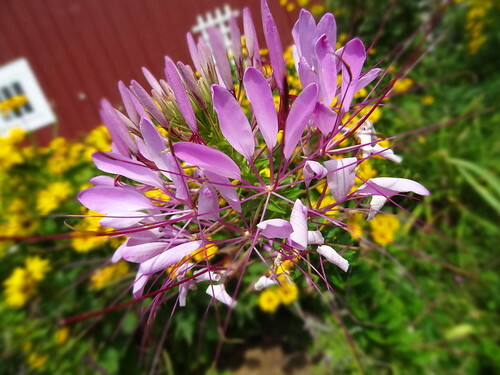 Perennial gardens are jam-packed with tall grasses, Black-Eyed Susan, butterfly bush and Russian sage; the Cleome are stunning. Old Magnolia Farm is just as beautiful as I remember it. 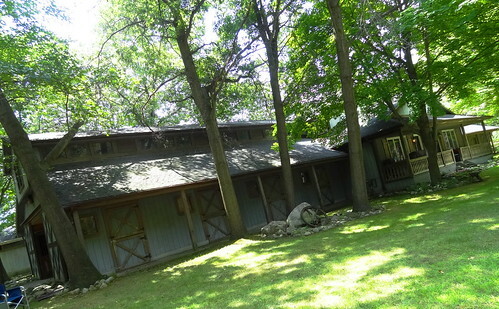 100 acres of riding trails, wooded areas, hay fields and of course the elegant home and stable. The grass is green and lush, the split-rail fence is black, gentle, rolling hills make up the terrain; you’d swear you were in Kentucky horse country. 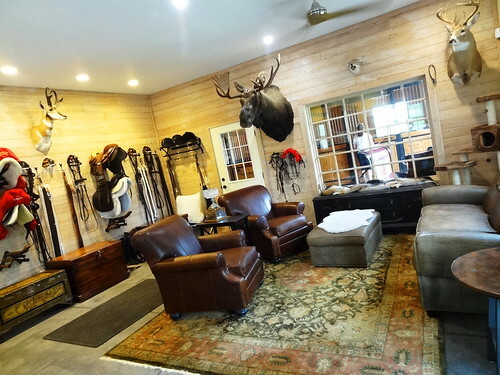 We stop in the tack room with its casual sitting area, cold bottles of water and sugar cookies in the shape of horses set out for guests. 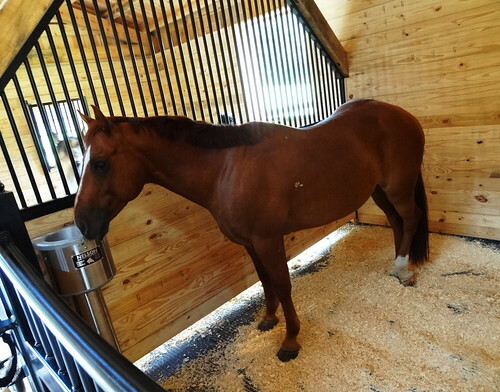 Horses appear content in their luxurious surroundings, they don’t seem to mind the extra attention from today’s visitors. We stroll along the covered walkway leading from the stable to the main house, mounds of Hydrangea wrap the corners of the home. Standing in the front yard we pause to take in the sight, there is tons of architectural detail, from the wrought iron on the second level to the more than a dozen arches surrounding the front porch, shrubs are perfectly manicured, flower-studded urns flank the front patio–sigh. Yeah, it’s that beautiful. 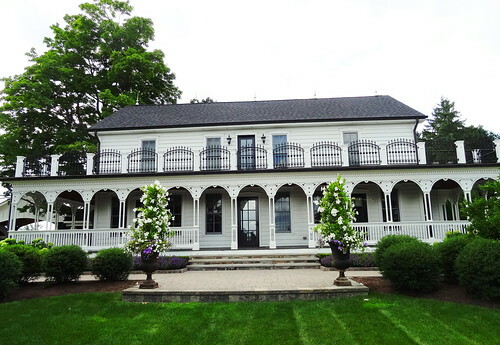 Black Fawn Farm covers 15 acres, the stable and house match in grey with crisp white trim and black shutters. They have a great horse weathervane. Outside I visit with the animals, a donkey shares yard space with horses, he’s doing his best to get his share of attention. 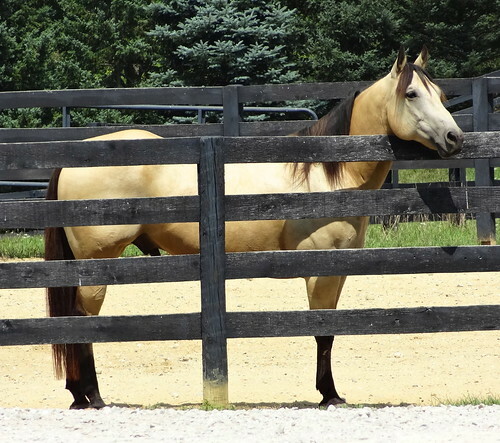 There are 5 fenced paddocks, a carriage barn and a horse barn with a pretty southern yellow pine interior. Stonehedge is home to many of the country’s top Arabian horses, it’s also a prominent breeding facility. 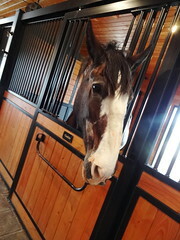 The long, rustic-looking stable sits on wooded property, inside, horse stalls wear the name of each tenant; as I pet each one I call them by name. 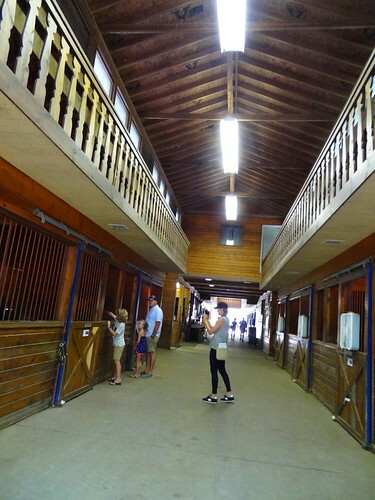 We wander around the barn complex into the arena, we end up in the indoor round pen designed by the owner, definitely unique. Stonefield Farm is 80 acres of land, the home, designed by architect John Vinci, is built in the style of Frank Lloyd Wright. Horizontal in nature the structure looks as if it’s built into the landscape, there are lots of windows to overlook the property, landscaping is naturalized. It’s s bit of a hike back to the barn built earlier this year. I’m going to make it up and say the barn is built of Pine, whatever kind of wood it is, it’s lovely. We enter through a sliding door and find ourselves in a cozy family room type space. 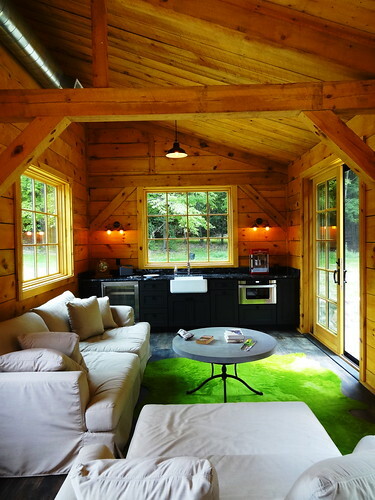 That same beautiful wood makes up the interior, couches look comfy and inviting, there’s even a mini kitchen. The stable area has that same cozy touch; the wood and wrought iron stalls give the barn a very open feel, I could definitely hang out here. 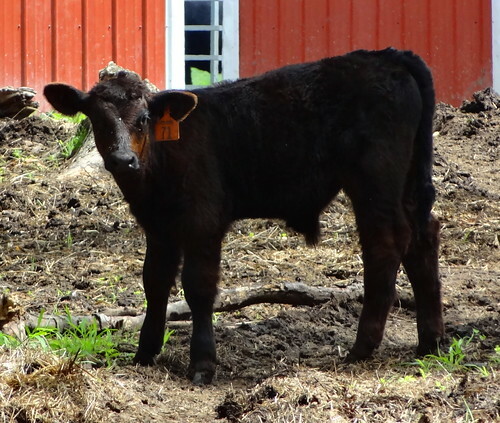 Stump Lane Farm has been owned by the same family since 1956, the name comes from the grass lane lined with tree stumps set on end, you can find more tree trunk sections embedded into the cement in the old section of the barn. 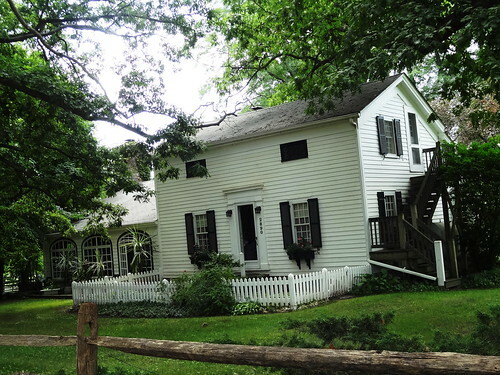 The house is a beauty in white with black shutters, flowers spill from window boxes. 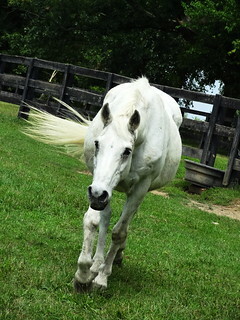 We walk over to see the horses, the white fellow catches a glimpse of us and trots over for a visit. Before we leave we cross the road and watch the herd of cows in the pasture. The little ones seem as curious about us as we are about them. Let’s eat! 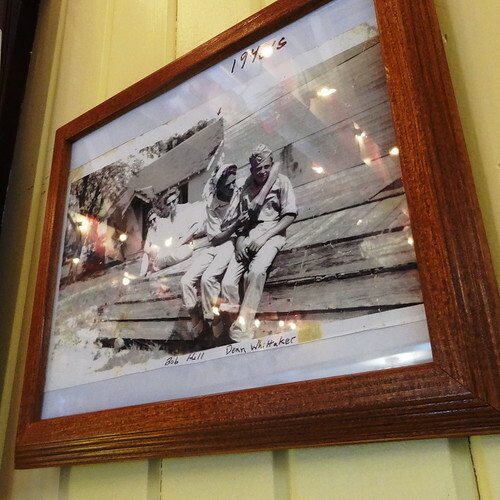 White Horse Inn re-opened in November of 2014 after a complete restoration, with its equestrian theme and homage to the days of fox-hunting and stagecoaches it’s the only proper place to eat today. As much as I love the interior, the weather is patio-perfect. Striped umbrellas hover over wrought iron tables and chairs, the exterior of the beautiful stone fireplace and weathered cedar adds a lovely touch. 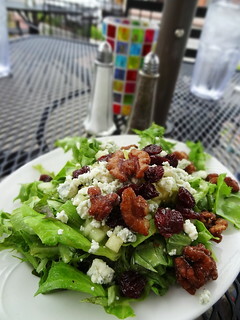 We start with the Orchard Salad; mixed greens, blue cheese, diced apple, candied walnuts and dried cherries splashed with maple vinaigrette. I love the different textures and the balance of sweet and tart. 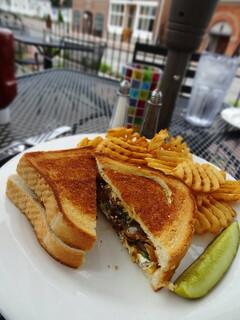 There’s a grilled cheese sandwich on special today; thick bread grilled with a blend of cheeses, sautéed onions and jalapeno peppers, the bread has a nice crunch and the filling oozes out with every bite, yum! The waffle fries are excellent. 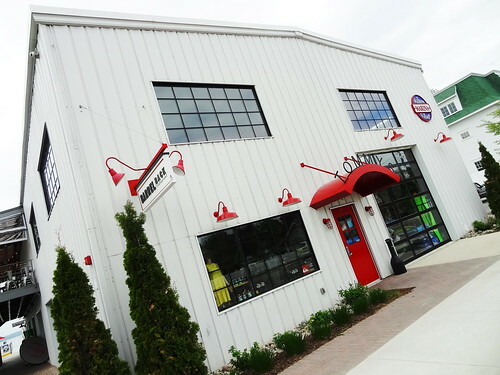 After much anticipation Metamora General has opened right across the street. 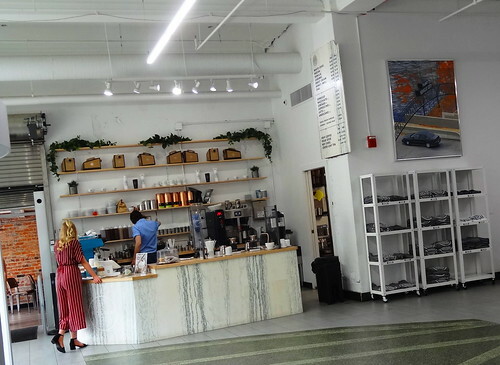 Brought to you by the same folks who own White Horse, the store is a blend of neighborhood coffee shop, convenience store, boutique and wine shop–you really have to see it to get it. 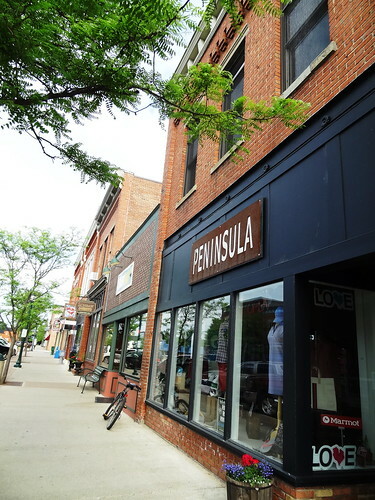 It is no surprise the shop is beautiful; from the relaxing patio area with casual seating and fall decor to the interior with its opulent chandeliers, cafe tables, grey subway tile and the handmade wood floor. 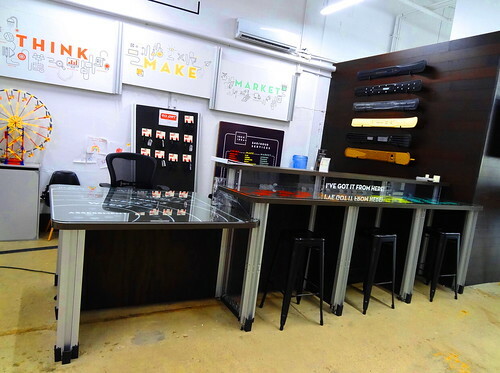 The shop is still in its infancy, you can get an espresso and drink it in the quaint surroundings, pick up a bottle of wine and a gift your party host, find a scarf or new handbag or grab one of Max’s donuts and a fountain drink for the road. Eventually there will be more food items and wine by the glass so stay tuned. 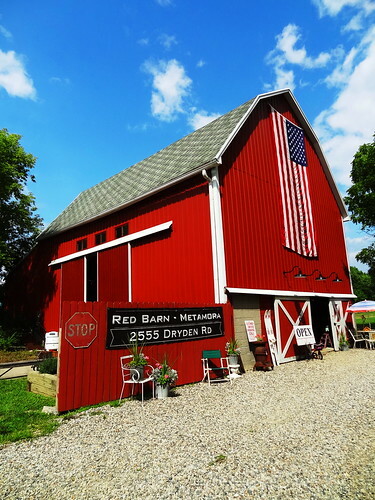 One more stop… Red Barn ~ Metamora is this great home accessory, found objects, antiques, furniture, gift shop located inside of, you guessed it, a big red barn. Outside Kris checks out the old tractor, I head inside, it’s extremely charming–that may have something to do with those strings of white lights I’m always telling you about. 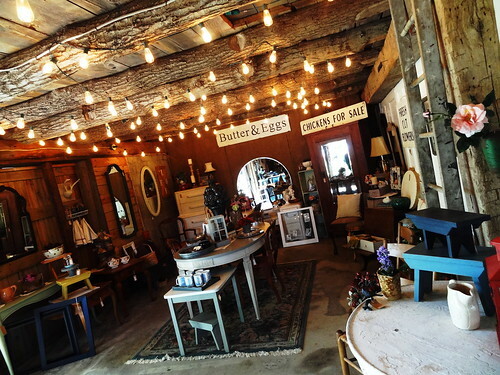 Items range from wicker chairs, antique bed frames, art deco, old signs, bird cages, milk glass, vintage mirrors, milk glass, candles, well, you get the idea. 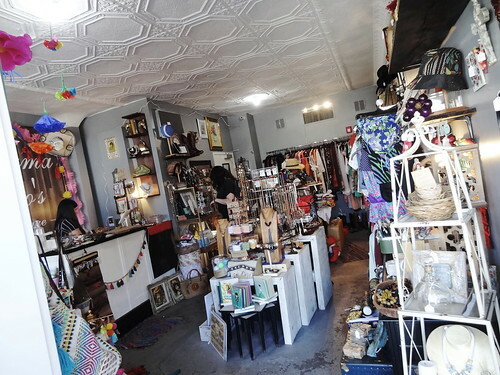 The owner has a great eye, she chooses quality merchandise and arranges it in a very appealing way. Every time we come there’s always something new. The stable tour only happens once a year but you can take a nice scenic ride to horse country any time. 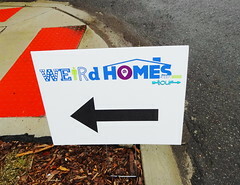 To some Weird is distasteful, uncomfortable, unpleasant. In others it piques their interest, curiosity, a sense of adventure. 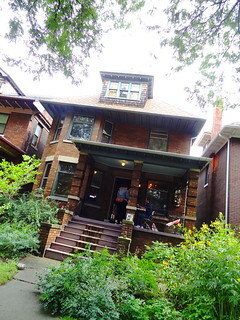 Kris and I definitely fall into the second group, which is why when we learned Detroit was hosting its first Weird Homes Tour we purchased tickets immediately. 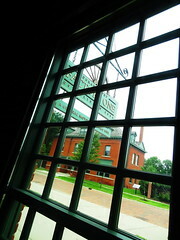 WHT are given in Austin, Portland, Detroit, Houston and New Orleans; 10% of gross ticket sales go to a local non-profit. Addresses are not given out until a day or two before the event. The tours are self-paced, self-driving visits to homes of artists, architects, collectors; you never know what you’ll see. We decide to attack the map from east to west; I feel like I’m on a scavenger hunt, I’m really excited about what we’re going to see today, one never knows what hidden gems are right under our nose… I love when things exceed my expectations, the first house definitely does. 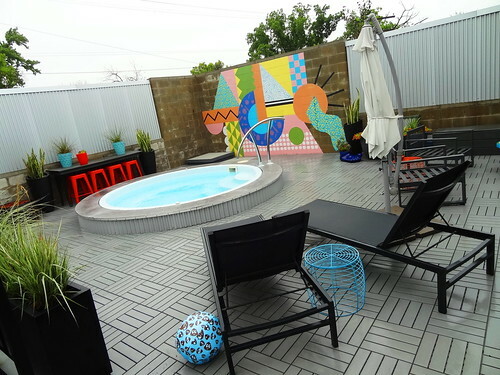 From the art gallery just inside the front door to the art on the walls, bold colors, vintage furnishings, to the hand painted murals to the pool on the roof, all I can say is Wow! Down a narrow hall, we enter a vast space filled with great pieces of furniture arranged around a very modern and unique fireplace. The building is constructed of grey cinder blocks, huge windows make the space bright, a circular theme is carried out in the round kitchen, circular stairway and black and white spiral on the kitchen floor. 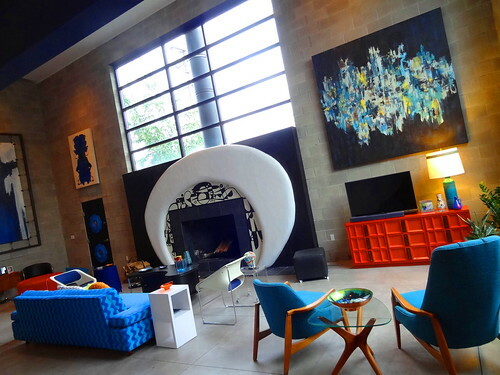 The owner created much of the art work herself, including the fireplace; furniture and accessories have been collected for more than 20 years. We exit through a doorwall onto the patio, a small table and chairs rest against a mural, up a flight of metal stairs we reach the roof. On the deck another mural serves as a backdrop to a small circular pool surrounded by lounge chairs and seating areas, greenery fills planters, massive trees in the distance make us feel far away from the city. What a way to start the tour! The next stop couldn’t be more different. 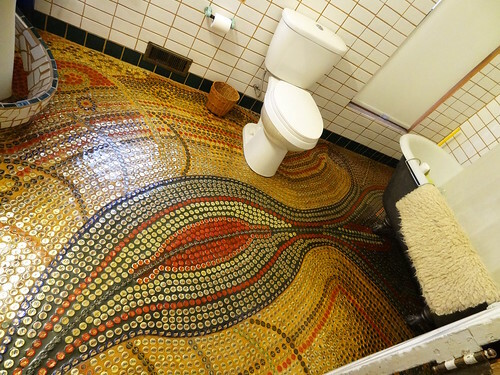 The owners of this quirky Victorian home have lived here for about 30 years. Through the Detroit Land Bank Authority the owners were able to purchase the rubble-filled side lot for $100. They’ve turned that space into a gorgeous cut flower farm called Detroit Abloom . 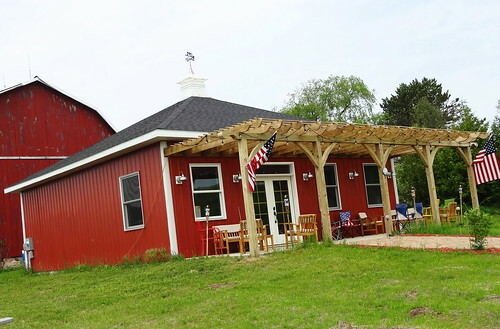 Their office is located here along with a flower arranging shed, a hoop house and a root cellar. 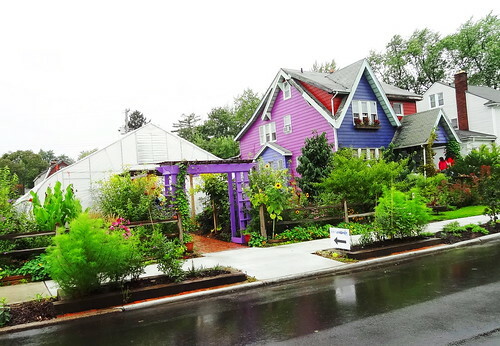 A few blocks away they have a larger flower farm, a few blocks from that is their vegetable garden; yep, farms, in a neighborhood, in the city. We walk under the purple pergola and step into the hoop house to find baskets of heirloom tomatoes and bars of lavender soap for sale. The place is amazing, so green and lush, so many plants, so many beautiful things. 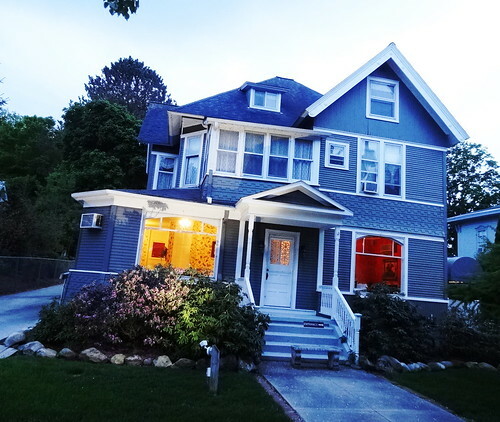 We walk next door to the multi-hued home, the purples and blues give it a whimsical feel. Inside we find all of the lovely characters of an old home, wet plaster walls, archways between rooms, built-ins, hardwood floors. There’s a funky little house near Eastern Market that seemed to just pop up one day out in the middle of nowhere, it’s the next house on our tour. 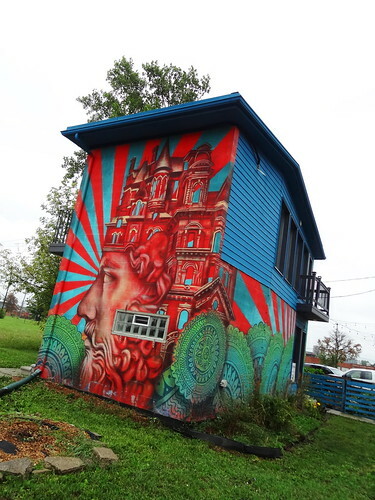 If you’ve been to eastern Market you’ll recognize the house immediately, its covered in colorful hand-painted murals, lots of bright blue, red and a guy’s head with a house coming out of the top–yes, that one. The 900 sq. 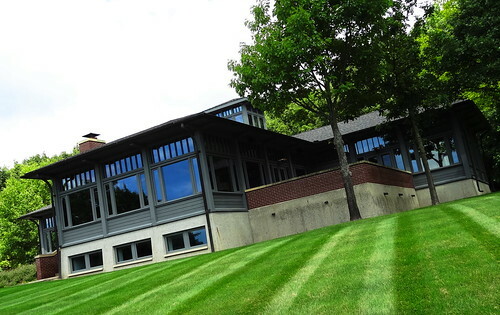 ft. home was built by Cranbrook Architectural Masters students; the home is their thesis statement. We spend a lot of time walking around the outside admiring the paint job, I really like the green and blue, lacey, spiro-graph-thingy’s all along the bottom. 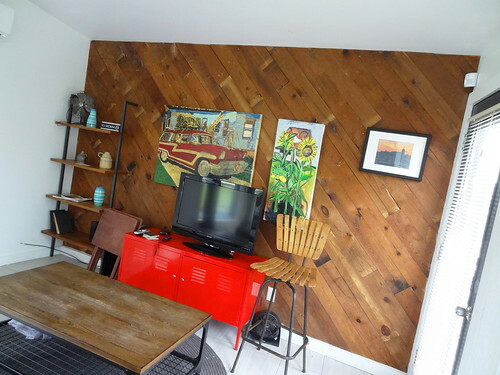 I learned that it is built of a mix of modern and salvaged materials and the upstairs wall is finished with tongue and flooring from a 1913 house. Want to see it for yourself? You can book a stay here through airbnb. 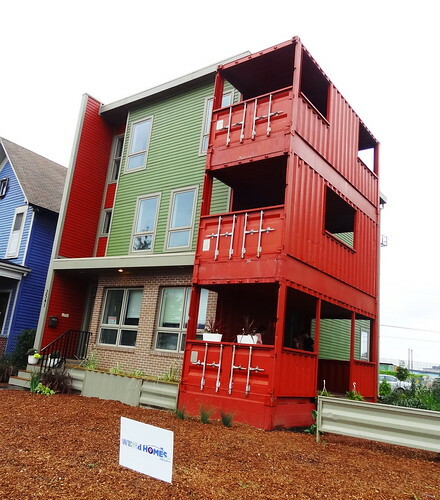 You’ve probably heard about homes and businesses being built out of steel cargo shipping containers. Did you know that these containers naturally meet all building and safety codes? Using containers saves about 25% over lumber construction, buildings go up in about half the time and can cut energy costs by 70%. How do I know this? I learned it at the next house on the tour. We’re at the Model Center of Three Squared, this 2,800 sq. ft. home itself was constructed of 6 containers; 3 layers of 2 side-by side containers, 3 more were stacked to create a balcony on each level. 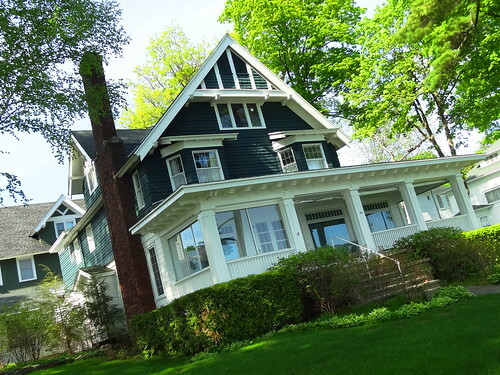 The exterior has that sort of modern look about it, it’s attractive in olive-green and russet. 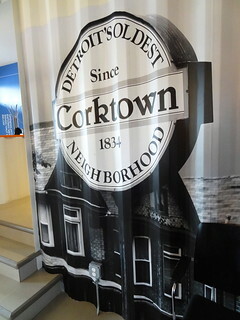 The open-concept interior is well laid out, family room, kitchen, island, dining room, all well decorated; my favorite thing is the black and white photo-wallpaper of the old Corktown Neighborhood sign. 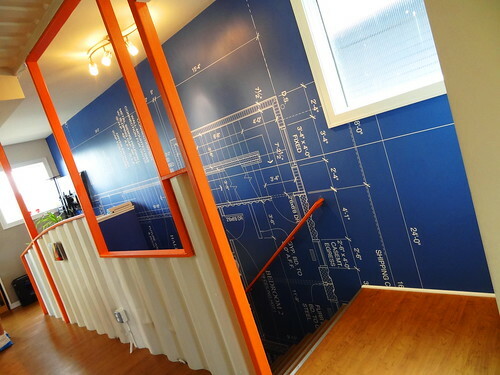 It’s really nice, the corrugated walls add interest. Giant blueprints of the home line the stairway wall, this is actually 2 units, a 2-story, 2 bedroom unit (the first and second floor) and a 1-bedroom unit on the third floor. How about some lunch? 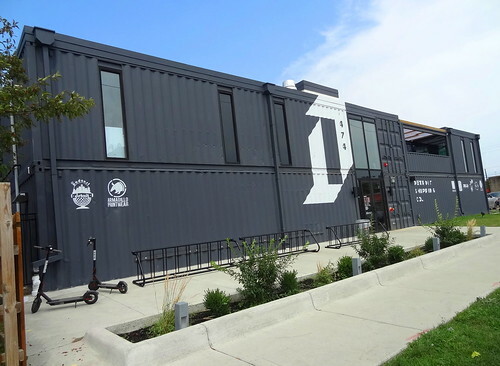 We go from the shipping container house to Detroit Shipping Company, a restaurant collective, beer garden like space made from 21 refurbished shipping containers on Peterboro. 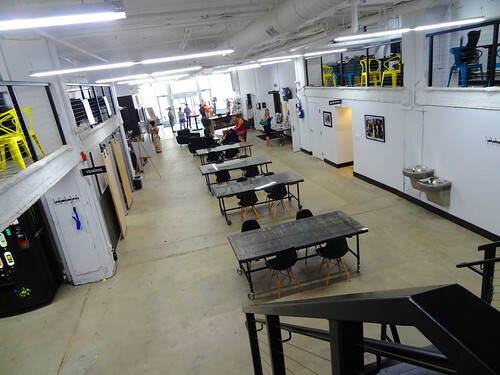 Right now there are three food-truck-style eateries, two full service bars, indoor and courtyard seating and a gallery. 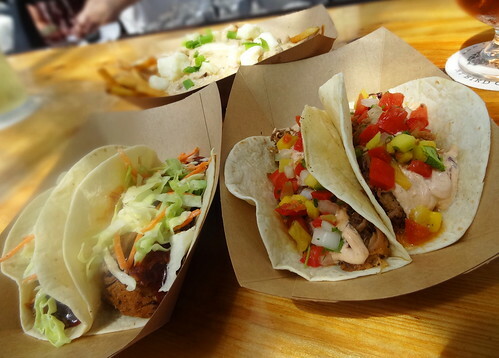 At Brujo Tacos and Tapas we order 3 of today’s tacos. I grab a table and wait for the food while Kris gets us a beer. The corn on the cob from Coop Caribbean Fusion is outstanding! 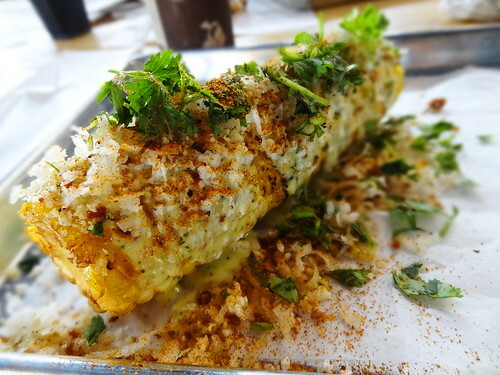 Cooked perfectly it’s loaded down with tamarind aioli, toasted coconut, queso fresco and cilantro; seriously the best corn we’ve ever had. 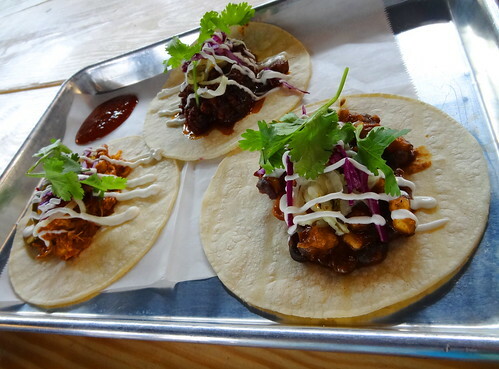 The tacos are delicious; bbq chicken, the pickles on top are a nice touch, lamb chorizo, just the right amount of spice and curry vegetable, a nice twist on a taco. 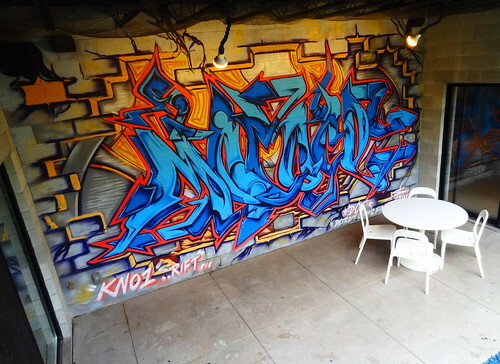 When we’re done eating we take a look around, it’s a really great place, upstairs in the West Gallery the featured artist for August is Jacinto, “A Detroit State of Mind” we really like his work. We walk through lounges and exit to the balcony overlooking the courtyard, what is it about those strings of white lights that we all like so much? Armadillo Printwear does on-demand screen printing, stop in pick out a shirt, a design and bam they print it up for you while you wait. They are also responsible for all of the Detroit Shipping Co merch. 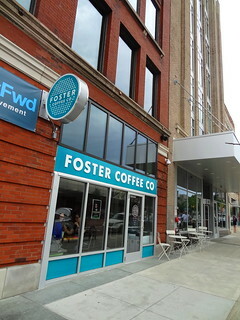 A coffee and ice cream shop along with two more restaurants are in the works, come check it out. 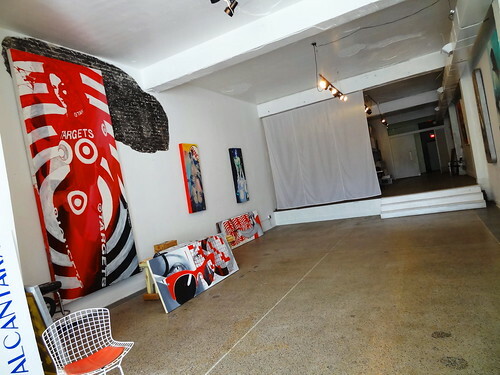 The Bankle Building on Woodward in Midtown Detroit is not your ordinary building. This is the half-time home of automotive designer and artist Camilo Pardo. 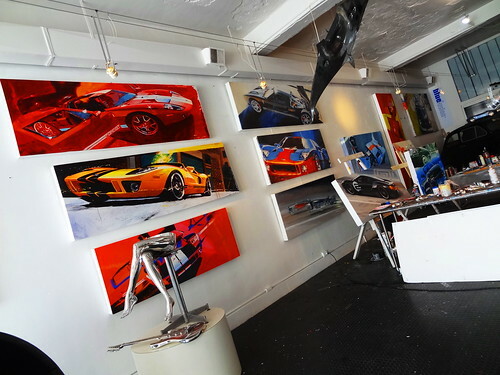 Inside, large automotive oil paintings are a blast of color against stark white walls, a messy work table and blank canvases are a sign of works-in-progress. 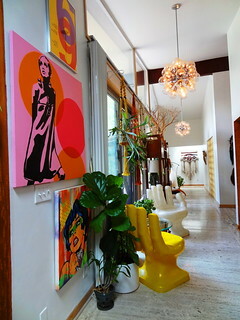 Tulip chairs, Egg chairs, chrome sculptures show the artist is clearly a fan of mid-century and pop art. 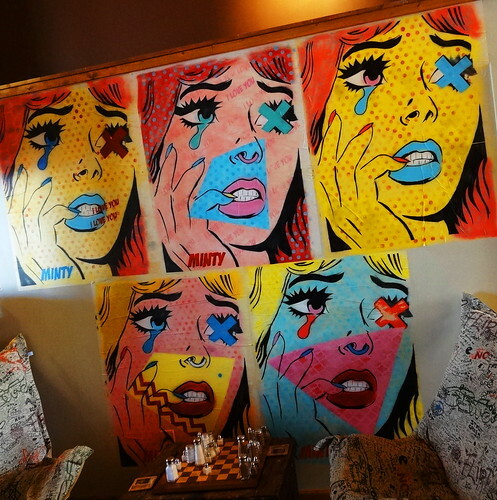 The art in the adjoining space is more female-centric. 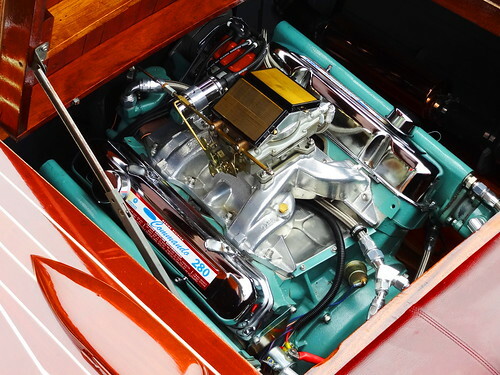 We even get to see where he stores his ’67 Mustang. The next house is a little further away but worth every mile to get here. The exterior of the home provides no clue to what we’ll see inside, kind of mysterious. 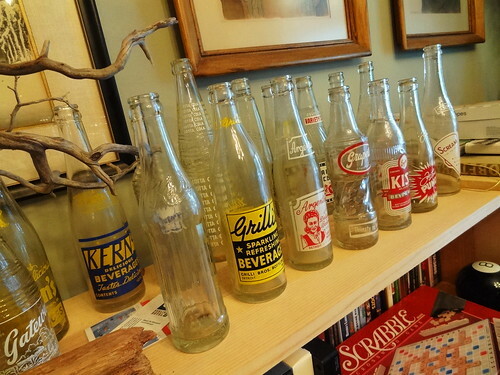 Immediately we understand the owner is a collector with an amazing talent for displaying her treasures. 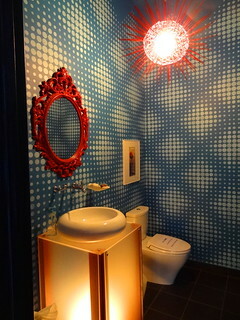 Every wall is a collage, each room has a theme. The yellow room is an homage to music; boom boxes are grouped together, she even has a boom box pillow, cassette tapes, vinyl albums and then the unexpected–necklaces, fun right? 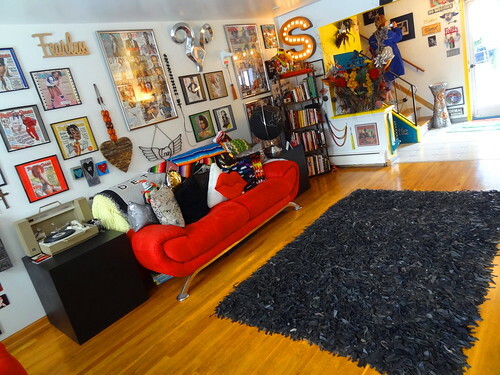 Every room holds another surprise; video games, religious items, Jazz, framed magazine covers, a sassy red couch. 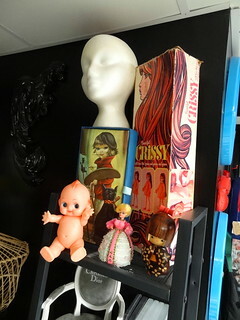 The basement is her showroom for her business Dollface Couture, along with her statement clothing we find a far-out couch, a burger telephone and a sweet doll collection. Fun and stylish indeed. 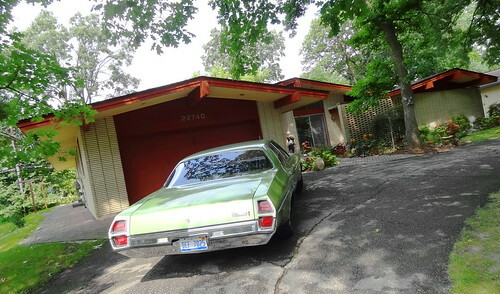 We’ve reached the last home on the tour, as soon as we see the exterior and the vintage green Oldsmobile in the driveway we know we’re going to love it. 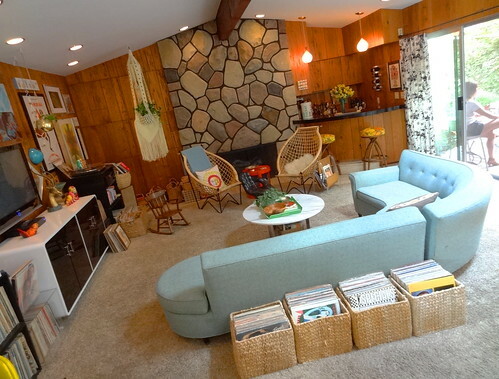 Mid-Century and Magnificent is the description in the booklet, they nailed it. The house was built in 1963, miraculously it has made it to 2018 without any remodeling. The couple that lives here now totally get the house, they’ve embraced and furnished it just as it would have been 55 years ago; it’s awesome. 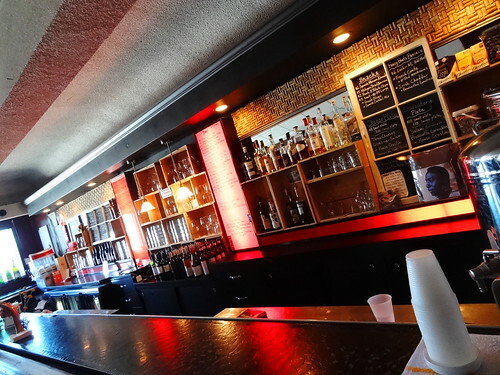 Look at the fireplace, the bar, the original Nutone built in radio, the booth-seating in the kitchen, and the light fixtures…Did I mention the geometric wall of mirrors? How cool is that. 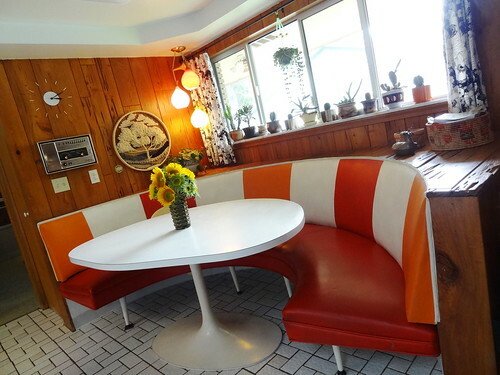 Of course it doesn’t hurt that the owners have been collecting mid-century decor for a couple of decades. It has been a wild, wonderful and delightfully weird day, I wouldn’t have it any other way. 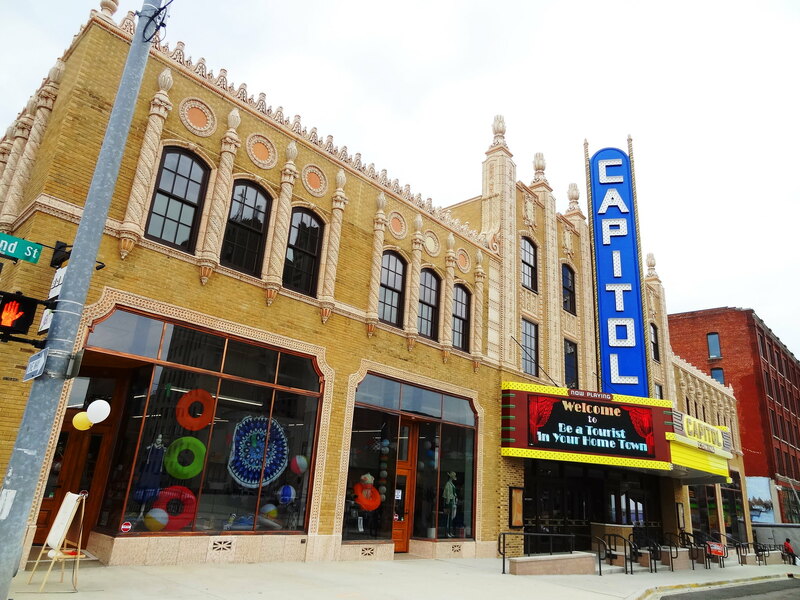 The Capitol Theatre opened in 1928 as a venue for live Vaudeville performances. 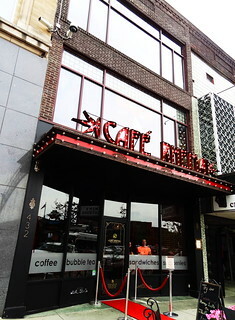 It became a movie palace then a rock venue hosting concerts like Black Sabbath, AC/DC and Green Day, it closed in 1996. 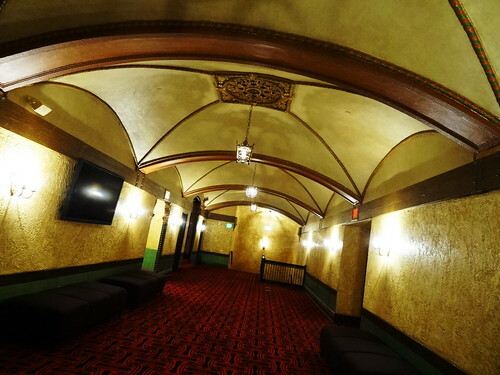 The building was purchased by Uptown Reinvestment Corp and The Whiting; after a complete $37 million dollar restoration the theatre is once again hosting live music, comedy, film, dance, and it’s on today’s tour. The exterior is definitely unique, they call it Hispano-Italian style, I call it gorgeous! The terracotta form work along the top of the building is exquisite, molds were made from the existing pieces and meticulously replicated, I can’t tell the original from the new. The original ‘Capitol” blade sign and marquee were restored, I bet it looks super-cool at night. Just inside the front doors lies the outer lobby, a geometric maze of plaster painted in gold, burgundy and purple hints at what we’ll find inside. 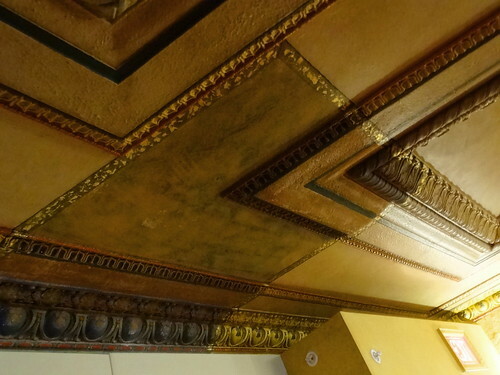 In the lobby the ceiling arches up, rosettes fill coffers, everything is trimmed out in gold. Heavily textured walls are parchment colored, the original light fixture seems small for the space, stairways lead off to the sides. We make a slight detour exiting through a side door into a long hall. Almost everything except the floor has been updated, this section is home to concessions and ticket sales. 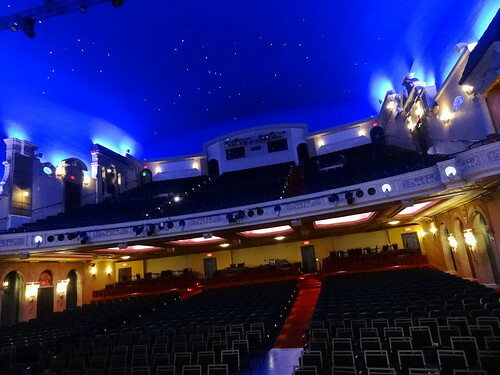 Now we make our entrance into the grand auditorium itself; it’s stunning. At first we’re in an area with a low ceiling, we’re actually under the balcony, the plaster work is spectacular, really chunky and with great depth. Our guide points out an original section of ceiling they left untouched during the restoration, you can see how they matched the original colors and took them up a notch, I love that they left that. Walking deeper into the theatre we have a clear view of it in its entirety, this is what they call an Atmospheric Theatre, this one is made to look like a Roman Piazza, some make-believe village in Italy. I don’t know where to look first so I start at the top. 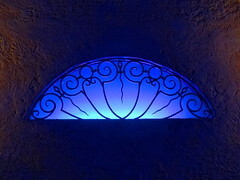 A lovely blue glow illuminates the night sky of the domed ceiling, stars twinkle in the twilight, if you look closely you can pick out constellations. 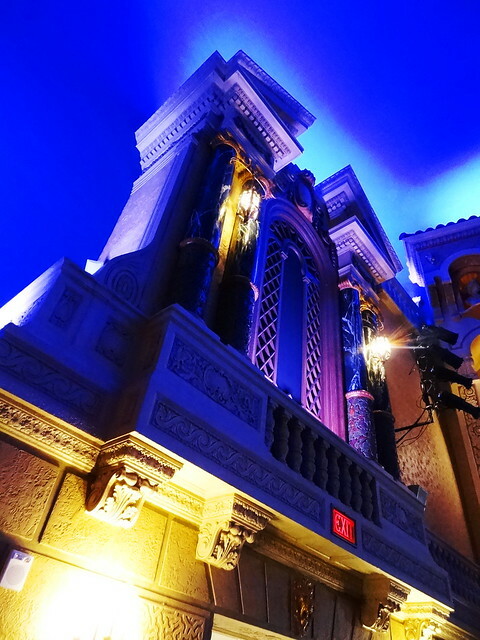 My eyes travel down from there, row after row of ornate molding surrounds the stage, the proscenium arch is richly detailed. 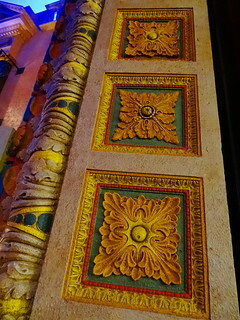 Ornate plaster is everywhere, lots of leaves, scrolls, faces. Looking at the sides gives me the feeling of being in a tiny village, lower block walls give way to mock structures with doorways, gates, windows, balconies; no two are the same. 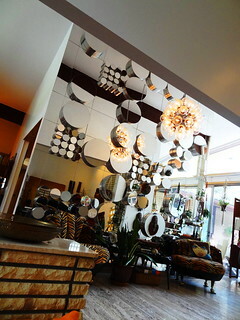 The light fixtures and sconces are opulent, all of them original and re-worked for l.e.d. bulbs. 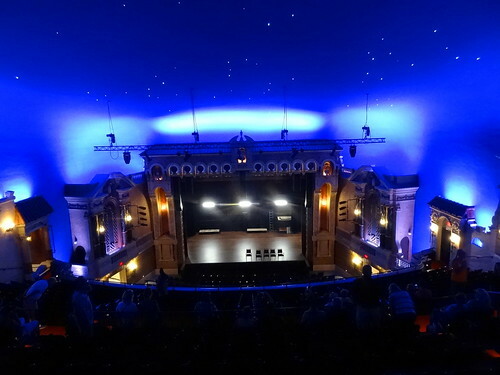 The group is invited onto the stage, it has perfect sight lines to get the entire atmospheric effect, wow! Some in our group talk among themselves, I overhear them telling others about how they used to come here in their youth, others are seeing it for the first time. 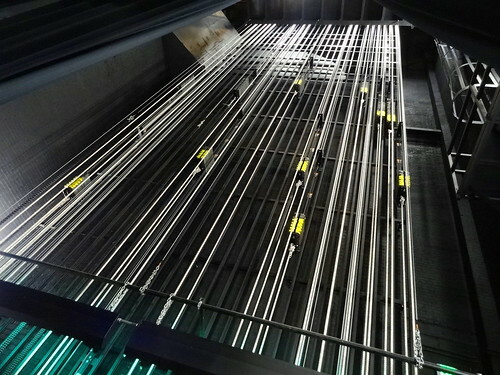 The rigging and lighting systems have all been updated with state-of-the art technology. 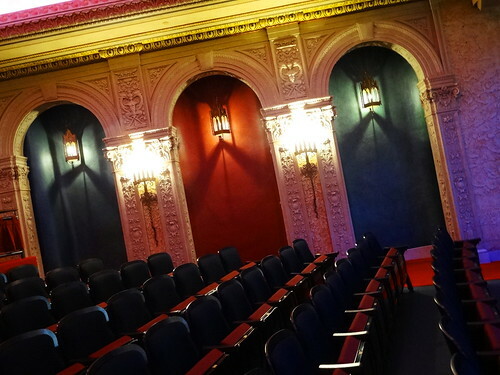 Because the stage area is small, large productions such as musicals are held at The Whiting. Descending from the stage we make our way across the main floor and up the stairs to the balcony, everybody spreads out, some sit while others are busy taking photos. From here we have a completely different view of things, now it’s like we’re right in the village; I feel like I could walk through the gate or sit on one of the balconies. 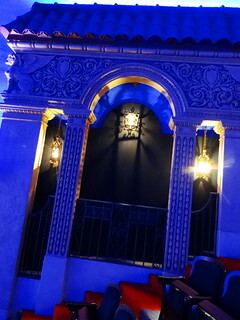 It took 14 months to complete the restoration, the theatre officially opened in June. 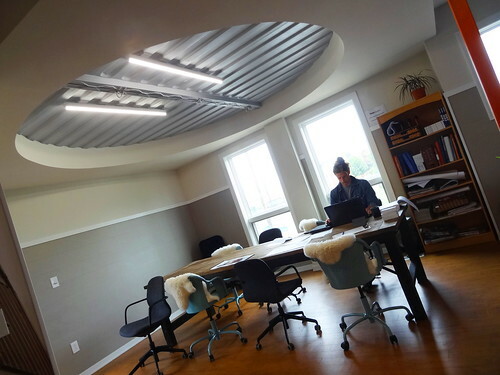 The street level of the Capitol Theatre building is home to new businesses Shift and Floradora share a space. 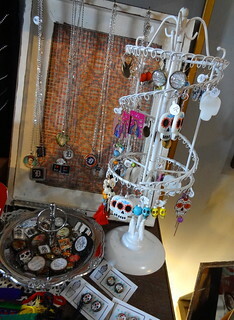 The boutique sells eclectic items for the home, jewelry, gifts, fun accessories and clothing; I like the funky decor. 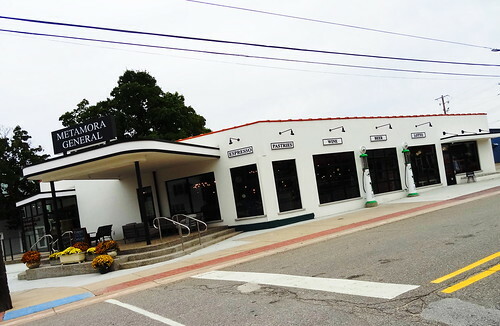 Floradora is an extension of the shops main space in the Flint Farmer’s Market. Pick up a bouquet of fresh flowers or place a custom order for that special occasion. 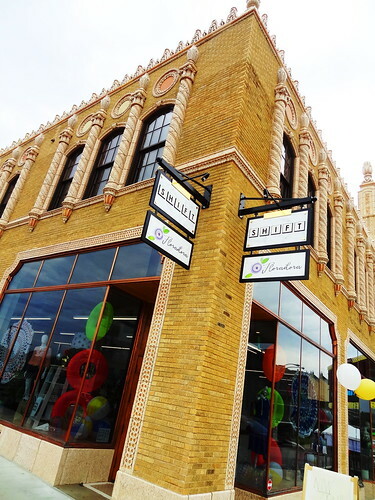 It’s great to see new retail coming into the downtown area, shops like these really attract foot traffic to the area. 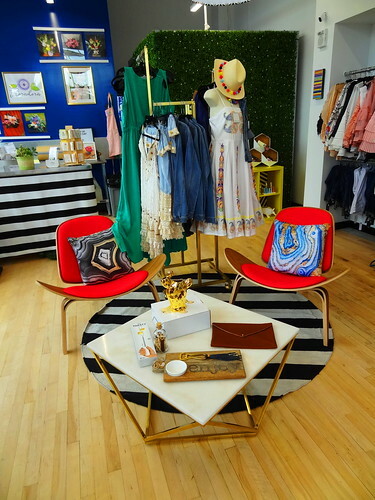 Now you can shop, eat and grab a coffee or cocktail in a walkable district. 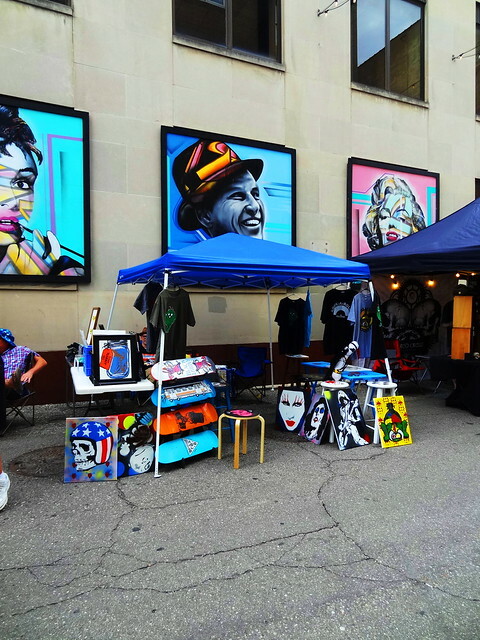 Alley Fest is taking place in the Buckham and Brush alley’s between 1st and 2nd streets, all we have to do is follow the sound of the music. Strings of lights zig zag between buildings, artists display their wares under canopy’s, pastel portraits of iconic stars are painted on the wall. The free festival is just getting started so it’s not too crowded yet. 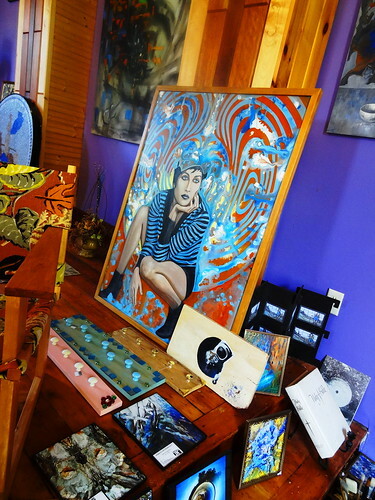 We check out clever t-shirts, painted skateboards, large canvases and metal jewelry. A crowd has gathered in front of the band at the far stage. 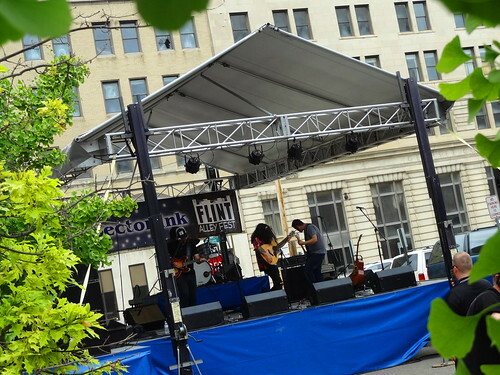 The festival focuses on all things Flint from the bands to the artists. 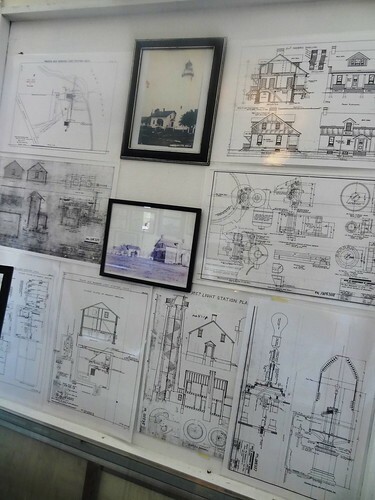 There are lots of things with the image of the water tower, it gives me chills. A steel door is propped open, people go in and out, I want to see what’s inside. 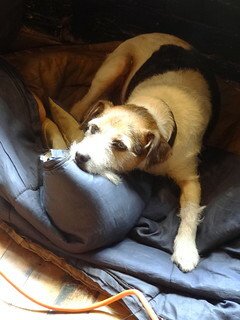 Near the door a dog lays comfortably in his bed, beyond him a set of shelves hold men’s shoes and boots, we’re inside Sutorial Boot and Shoe Makers. 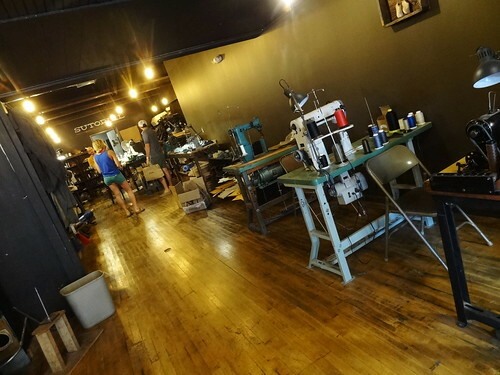 This place is way cool, old industrial sewing machines are put to use creating custom hand-made shoes and boots for clients. 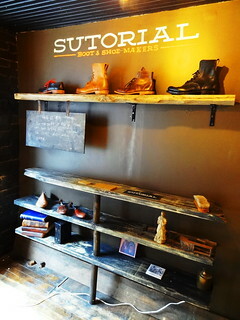 Cut-outs of soles and forms lay scattered about, the owner is talking to a group of curious people like us. 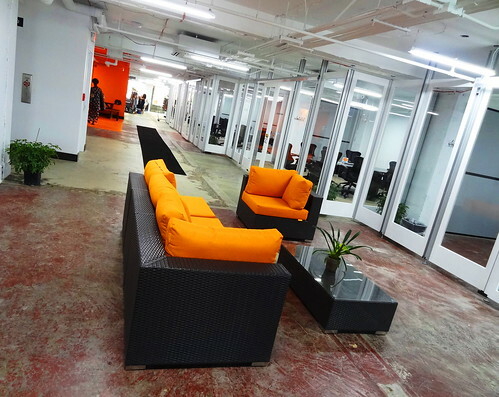 There’s barely room to walk in the space that serves as showplace and workspace. It’s nice to see things being done the old-fashioned way. We’ve covered everything in the downtown area, we’re ready to move on a little further. As we drive over to Grand Traverse Street I read a piece of graffiti on a wall that says “The world is a dangerous place to live. Not because of the evil but because of the people who do nothing about it.” The people of Flint know that all to well. Time to kick back and have a beer. 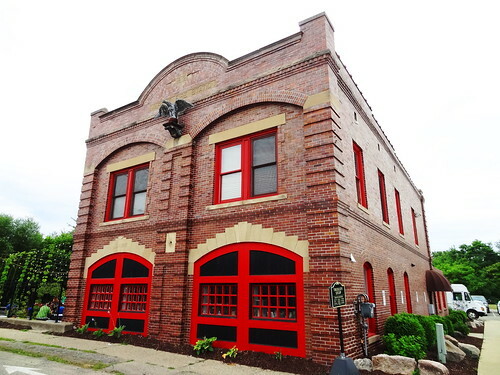 Tenacity Brewing occupies a beautifully renovated brown brick building that used to be a firehouse; food trucks are parked out back, hops grow on the patio. The interior is casual, low-key, comfortable. Unique little gathering spaces are tucked away here and there, clear growlers turned into pendant lights hang above the L-shaped bar. 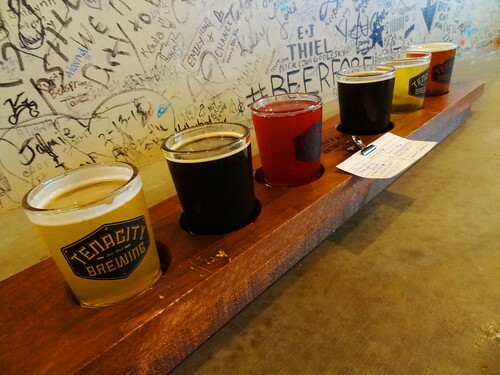 Unable to choose one or two to share we do a flight of six; they also have cold brewed coffee and root beer on tap. 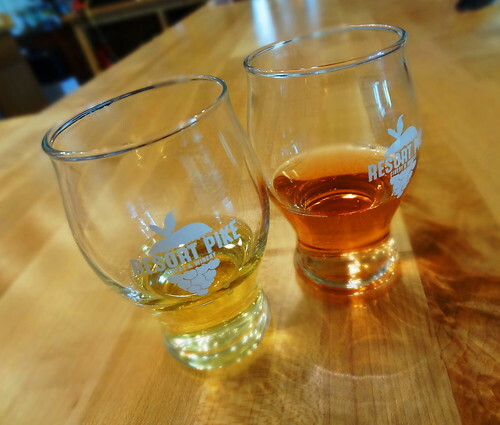 We drink hard cider, stout, a smoky porter and ale, a really good variety. 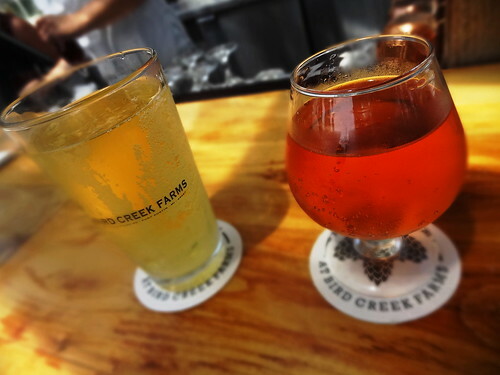 The stout is my favorite, Kris’s is the Honey Blu Blu Cider. 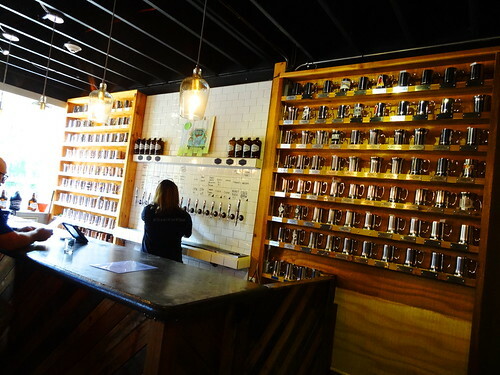 By the amount of pewter mugs filling the shelves behind the bar I’d say they have a loyal following. Here’s what it says on their website: “The story is quite simple. A few of us who happen to like beer and love Flint got together and decided that our town needs a brewery. So we went to work creating one. 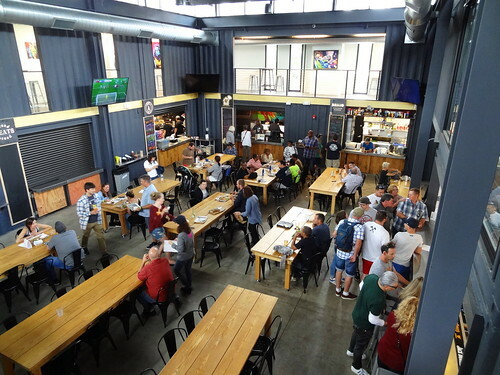 Keeping with the resolve and determination of Flint despite its ups and downs, and because we knew opening a brewery would not be easy, we named it Tenacity Brewing.” These are the kind of people who make a difference, they change a city, change perceptions, change minds. I hope you’ll make your way to Flint soon and see all the good things happening for yourself. It’s in the mid 90’s… again; we scan the weather forecast, looks like the Lake Huron breeze is going to help us out, low 80’s on the thumb coast. 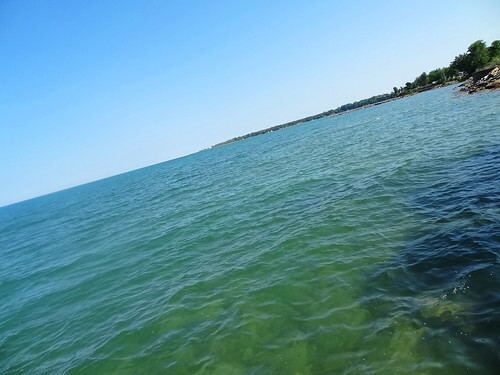 We point the car north and aim for the tip of the thumb, in less than 2 hours we’re looking at the beautiful blue waters of Lake Huron. 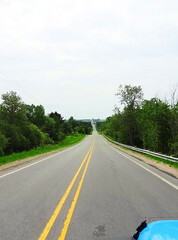 Kris zig zags his way north and west to Caseville Rd, we make a right on 25, this is where the view gets really good. The lake is gorgeous, a kaleidoscope of blues and greens, cars fill cottage driveways, beach-goers have their arms full carrying towels, coolers and floating devices, I swear I can smell Coppertone in the breeze. We follow the shoreline north and slightly east, public parks and beaches are in high demand today. We catch glimpses of the lake between cottages; many look like they were built in the 1950’s, others are new and stately like something from HGTV. 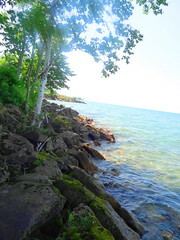 We reach Port Austin, park and walk out to the lake. The town is buzzing with tourists, lines form at restaurants and cafes, we have something else in mind. 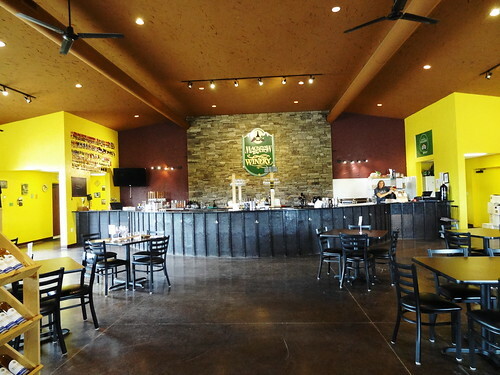 A short drive from downtown Port Austin on Grindstone Rd leads us to The Tap Room At Bird Creek Farms. The 40-acre farm grows alfalfa for local dairy farmers, vegetables, strawberries, raspberries, edible flowers; their largest crop is garlic. The large white farmhouse has an inviting wrap-around porch, pretty planter boxes and colorful hanging pots; all of the activity is out back. 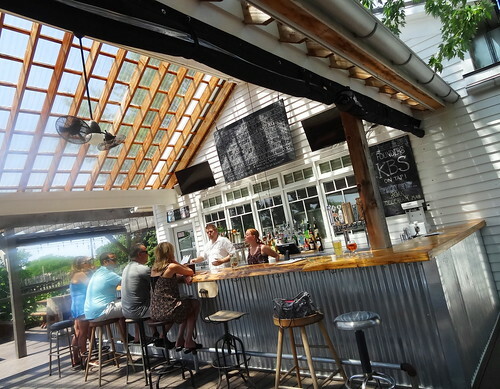 The covered deck plays host to a corrugated metal bar, mismatched bar stools and tables; a brief menu lists today’s food offerings, a chalkboard lists beverages. Kris is drinking B Nektar’s Zombie Killer, I’m having Blake’s Flannel Mouth; crisp and cool it’s perfect for a day like today. Before long cardboard serving cartons arrive filled with Sausage Gravy Poutine Fries, traditional BBQ Pulled Pork Tacos and Baja Tacos. Everything is very tasty, they even manage to keep the fries crispy under all that yummy gravy. Continuing our lakeside journey we drive on to Grindstone City. 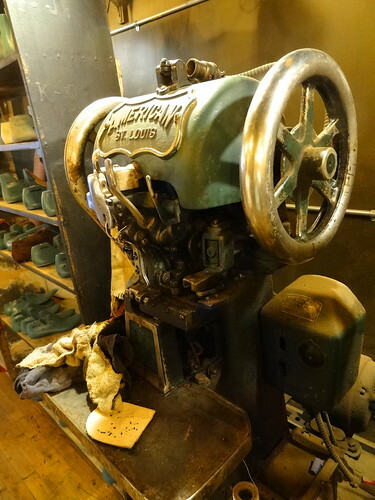 In the mid 1800’s two companies operated out of two quarries producing grindstones; by 1888 the population rose to 1500 people. Unable to survive the Great Depression the companies folded. 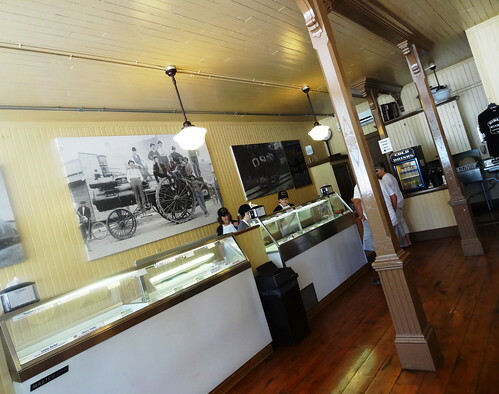 There are two buildings left in the Historic District, one of them is the 3-story grain mill, the other is Rybak’s Ice Cream Store built in 1884 by Capt. A.G. Peer. Visitors sit on benches placed on the deep front porch when we arrive, each has their hands full eating humongous ice cream cones. 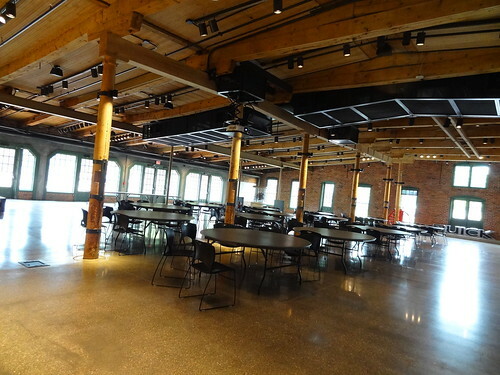 The building is charming in that very old-fashioned way; floors creek, black and white photos line the walls, antique lights illuminate the space, posts are quite decorative. There are a variety of items for sale, candies, cards, gifts and notions; I’m here for the ice cream. 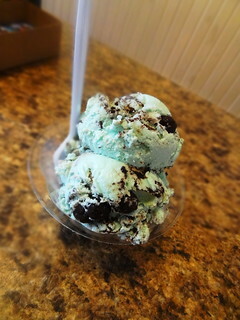 I study the list of Guernsey flavors and choose the mint chocolate chip, it has some kind of dark chocolate cookie chunks in it too, it’s sooo good! I have to eat it quickly before it all melts. White Church Gallery is just across the street, I meet Kris inside. 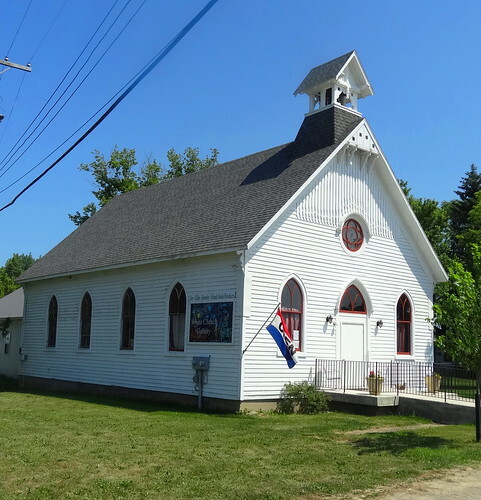 The building is a simple white church with red-trimmed Gothic-style windows. 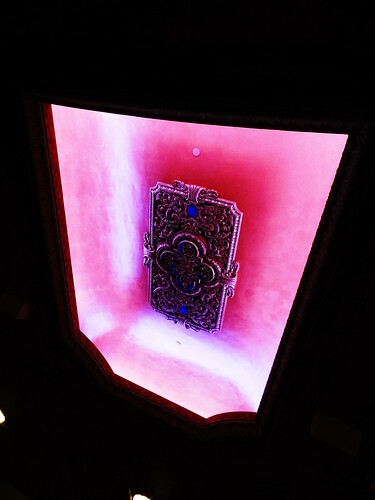 Inside purple paint covers the walls, a mix of old and new light fixtures hang from the ceiling; the way the light is coming in right now everything seems to glow. 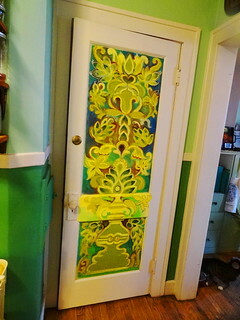 In the front room a gorgeous Art Nouveau cabinet is used to display the works of Michigan fine artists. 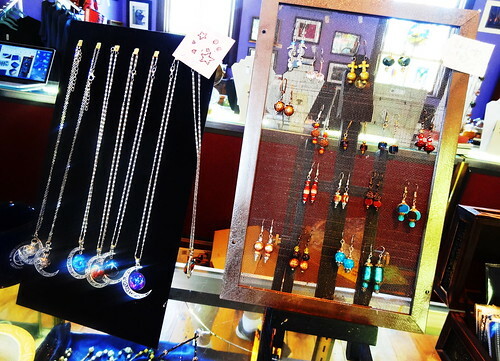 We wander around on wide-plank floors looking at photography, lovely jewelry, life-like paintings, stained glass and attractive wooden bowls. 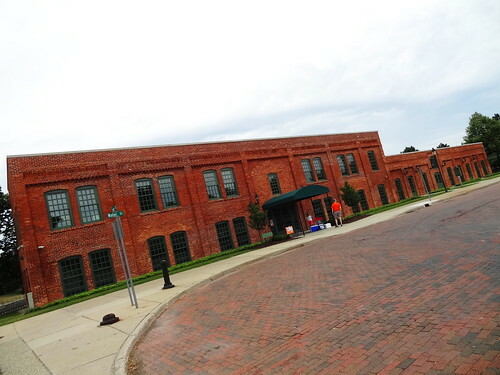 We are headed south and east on 25 passing through Historic Huron City. 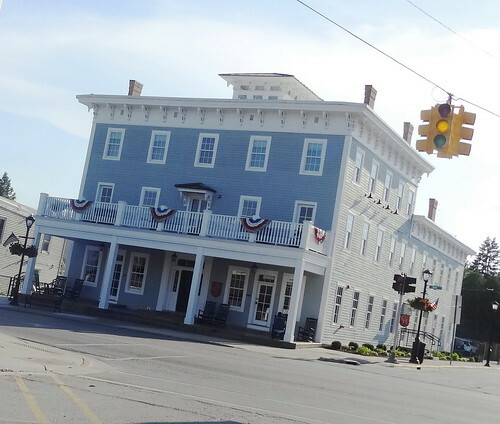 This was a lumber town back in the mid 1800’s, several of the original buildings still remain, they are maintained through the Lyon Phelps Foundation. 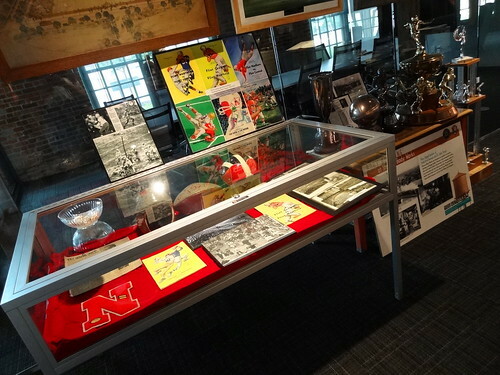 The buildings are open to tour on Saturdays in July and August from 11 am – 4 pm. The Pointe Aux Barque Lighthouse is next. 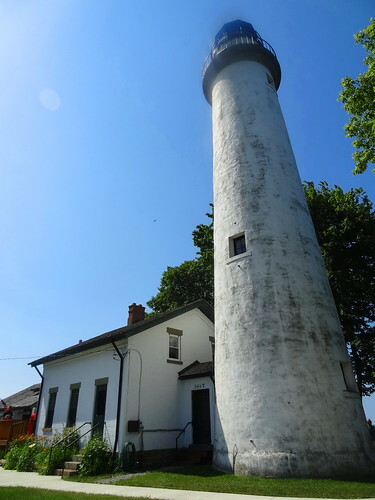 The original lighthouse was constructed of stone taken from the shores of Lake Huron in 1848,the light keepers house was separate from the tower. This area was complete wilderness back then, winters were rough, storms were wicked. 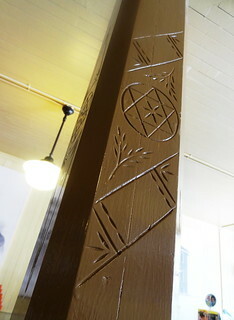 The weather and a fire took their toll on the building, a new structure was built in 1857, this time living quarters were attached to the tower. 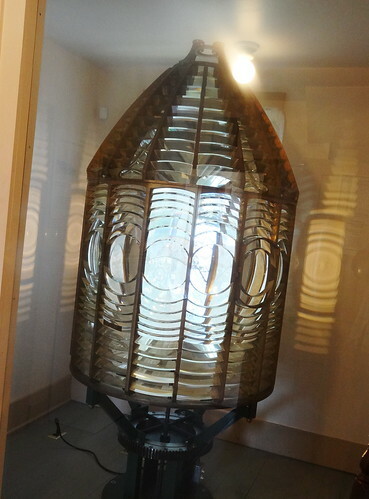 The light is still in use making it one of the oldest, continuously operating lights on the Great Lakes. The house and tower have been completely restored, it’s now a museum open to the public and it’s free. Let’s go in. 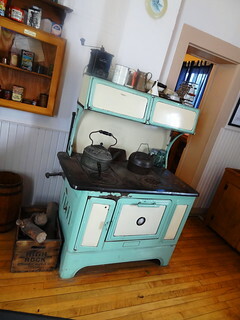 We walk around in the house where the light keeper lived, rooms are tiny, I like the turquoise stove in the kitchen. 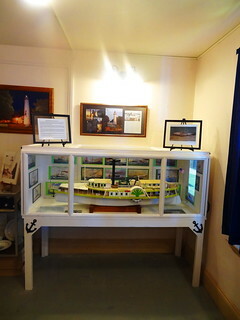 Artifacts are on display; models of ships, books, newspaper articles, blueprints of the building and a lens. The sleeping quarters are upstairs, there’s an old wood-burning stove to keep the family warm and a pitcher and bowl for washing up. 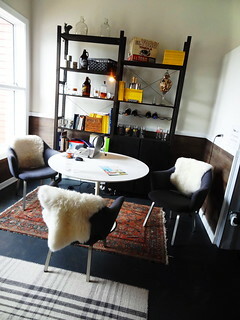 You had to maximize space so rooms were multi-purpose, beds share the space with a sitting area and desk. Back on ground level we learn more about the history of the lighthouse and the people who lived here. 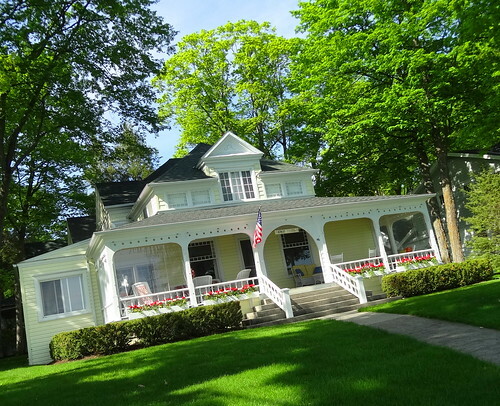 Outside we walk around the grounds, in 1875 a Class A lifesaving station was built south of the house, it was the first lifesaving station on the Great Lakes. In 62 years of service the crews performed over 200 rescues. Walking toward Lake Huron I stop and read the signs telling us about shipwrecks and storms, the Great Storm of 1913 also referred to as the “White Hurricane” is legendary, it was a blizzard with hurricane-force winds. It killed 250 people, destroyed 19 ships and stranded 19 others. 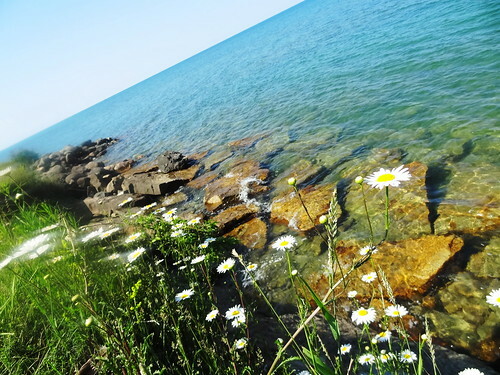 Today the lake is calm and beautiful, bluish-green water laps at the rocky shore, trees cling to the coast line, wildflowers grip the sandy soil, the water is clear to the bottom. Kris traverses the rocks, you can see how they’ve broken away from the shoreline. Notice their unusual coloring, almost like they’re rusty, moss covers the ones closest to shore, it’s slippery so he has to be careful. Meanwhile I stand on shore looking out into infinity. 25 leads us through Port Hope and Harbor Beach, the beaches, lake and piers are shrouded in swimsuit clad visitors. 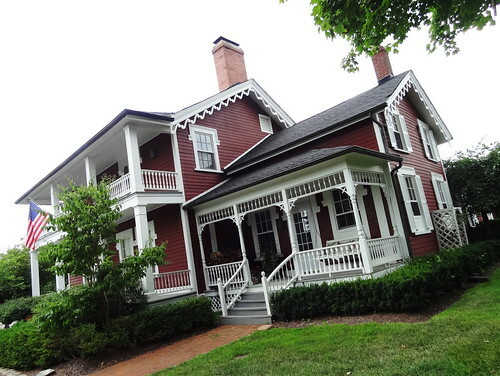 We stop in Lexington to get something cold to drink, to our delight the Cadillac House Inn and Tavern is open. 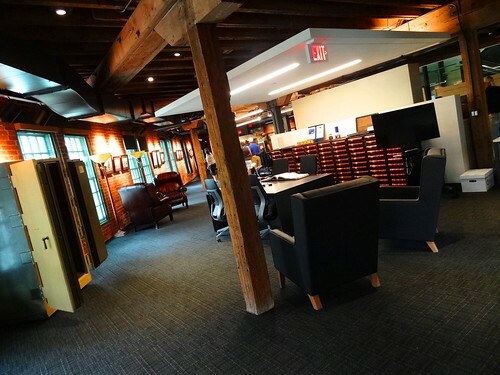 The building has been completely renovated back to its 1859 glory. When it opened July 4, 1860, it was such a big deal they celebrated with a parade and a steamer ship brought guests all the way from Detroit for the occasion. 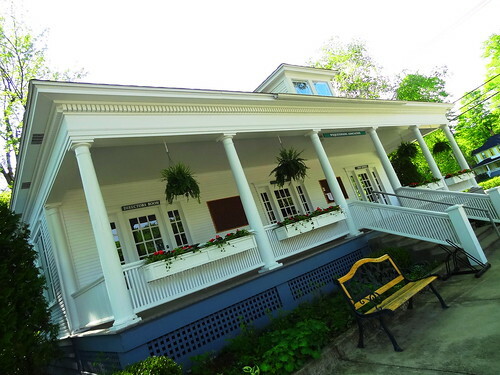 The 3-story Italianate structure has never looked better! We enter the building and are greeted with a blast of cold air, the dining room is busy, guests are in a waiting area to be seated. There are empty bar stools at the bar, perfect. Kris orders a craft cocktail with Gin, blueberries and lemon, I’m having a Kalamazoo Stout. I like the simple interior; antique-looking lights, wide moldings and wood beams. It feels good to sit back, cool off and enjoy a drink. It’s nice to see people embracing the old Cadillac House once again. It’s been a full day of Lake Huron adventures, we’ve enjoyed good food, good booze lake breezes and unbeatable views. 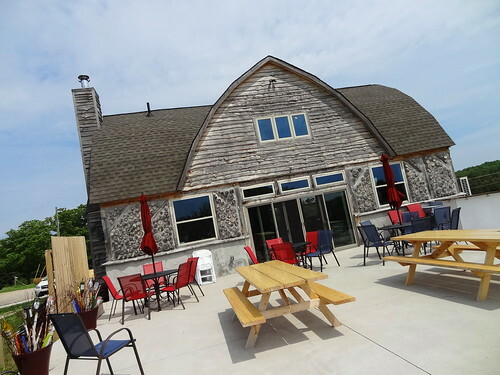 Today’s excursion takes us to northwest Michigan’s Bay View Wine Trail. We picked up a brochure in town with a list of all of the wineries and an area map, let’s go. Heading east out of Charlevoix we quickly find ourselves looking at beautiful countryside, roads are smooth and absent of traffic. 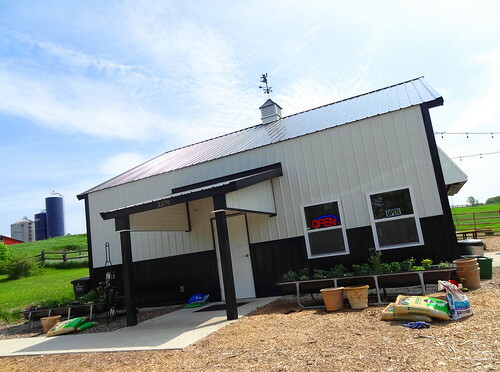 Rudbeckia Farm and Winery is tucked away on 190 acres of farmland and open fields, a small metal building welcomes visitors. You can sit outside, have a glass of wine and something to eat, play Bocce or corn hole, go for a walk, you can even fly a kite. We’re here to do a tasting. 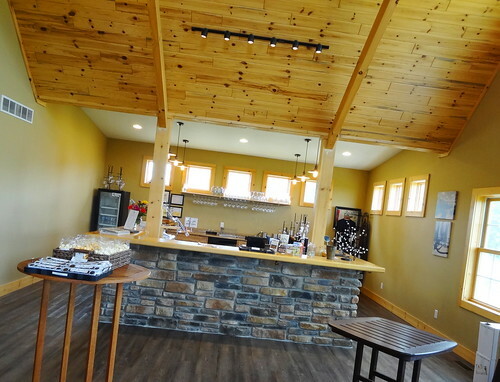 Inside we have the pleasure of meeting one of the owners, he tells us the story of how he went from living on the east coast to having his own winery here in northern Michigan; let’s just say it’s a dream come true for he and his wife. We taste wines and continue our chatter, they serve both wine and beer in Riedel Crystal tasting glassware. We enjoy everything we try, decisions made, we make our purchase and it’s on to the next place. 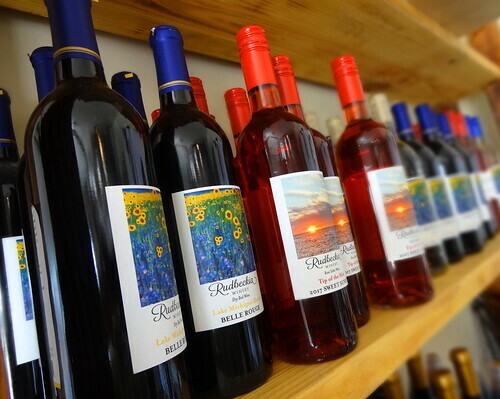 Walloon Lake Winery is family owned with 7 acres of grapes on the 36 acre farm; they produce boutique wines made from cold-hardy grapes. I really like this place and always look forward to coming back. 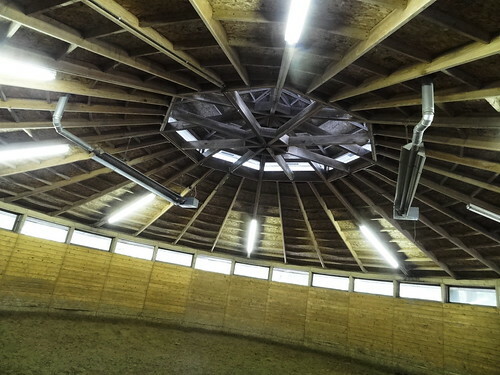 The building is unique, made from stacked cordwood, it’s pretty inside and out. 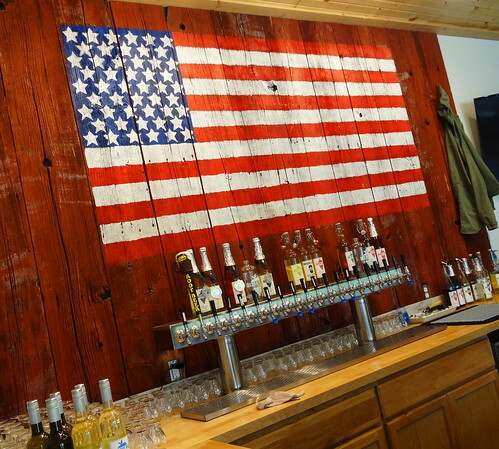 Sunlight floods the tasting room, it has an open, airy feel, lots of wood, Michigan-themed artwork, wooden crates hold bottles of wine and Walloon Lake Winery merchandise; their logo, of course, is the shape of Walloon Lake. 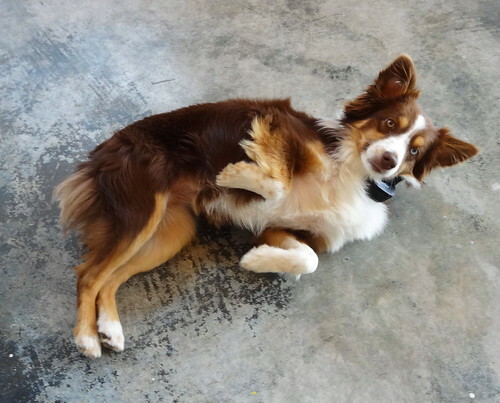 The resident dog greets us at the door, he checks us out then finds a place on the floor to take a nap. 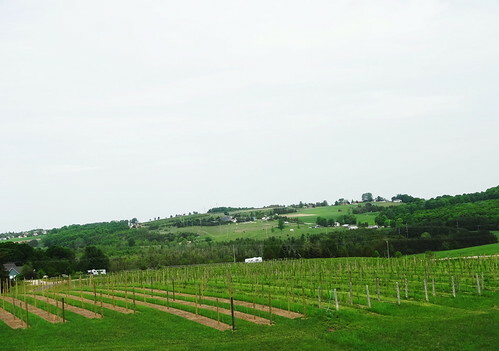 We begin the tasting process, I find I like everything they produce here; before long I realize we’re going to need a box… We go out to the patio to take in the view, it’s absolutely gorgeous; vineyards, rolling hills, valley’s, wooded areas, check out their tractor–sweet! 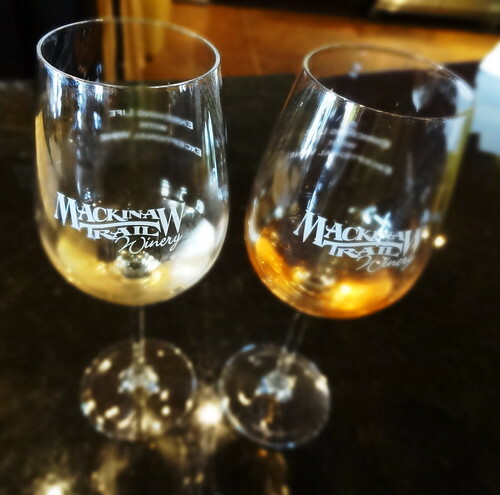 We traverse inclines and slopes, twists and turns through tranquil surroundings, Mackinaw Trail Winery is next. 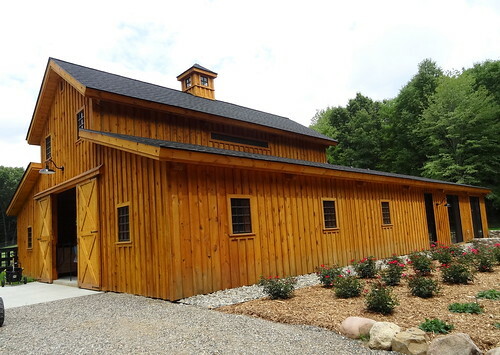 The building is larger and fancier than the previous wineries, situated on 30 acres, 15 of them are dedicated to growing grapes. 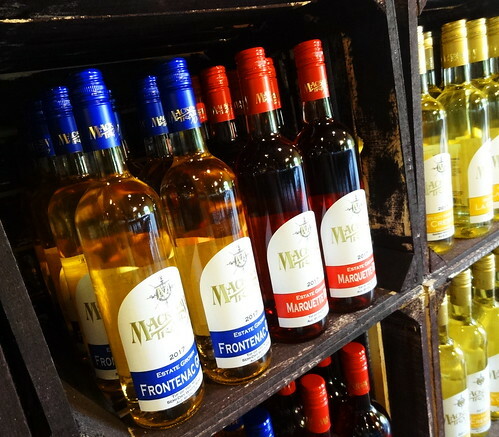 Family owned, the winery is best known for its fruit wines. 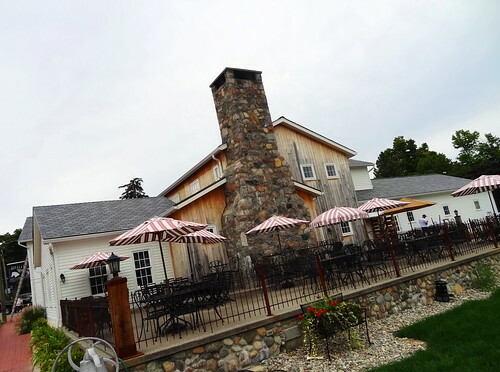 Having been awarded over 50 medals and 6 Best of Class awards it is one of Michigan’s most awarded and recognized wineries. 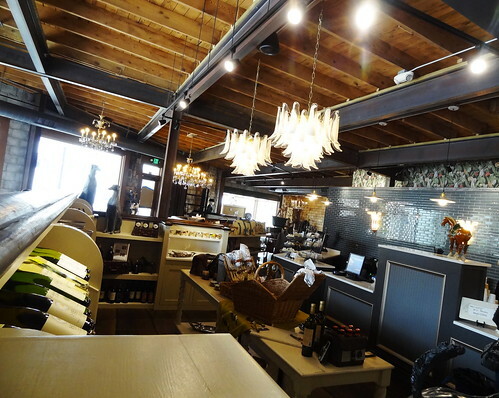 The tasting room is spacious, there are tables and chairs, multiple shelves filled with bottles of wine and a large bar for tastings. At this point we’ve had a lot of wine and we’re starting to get hungry so we get an order of pretzel bites, served with mustard and a cheese sauce for dipping I find myself wishing we got 2 orders. I’m not really fond of fruit wines but I have to admit Michigan wine-makers produce some really excellent varieties. 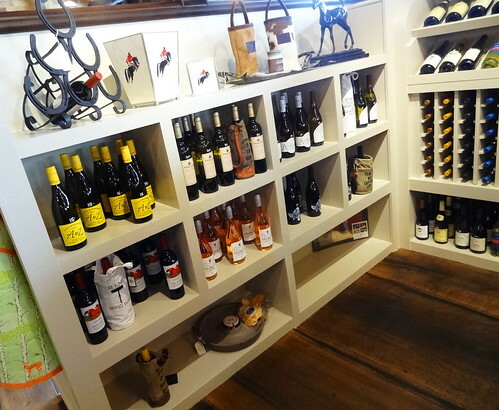 We go down the list choosing and tasting, I like to try and get something different at each winery we visit; we’re bringing home a bottle of their Estate Grown Frontenac Gris. 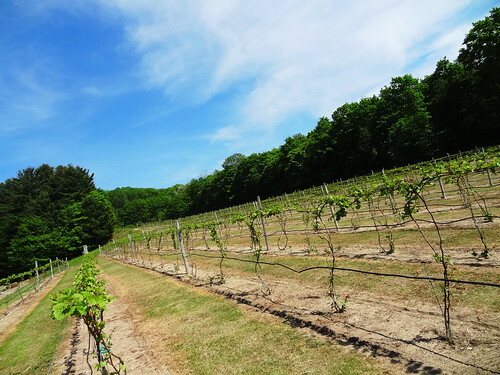 Petoskey Farms Vineyard and Winery will be our last stop before lunch. 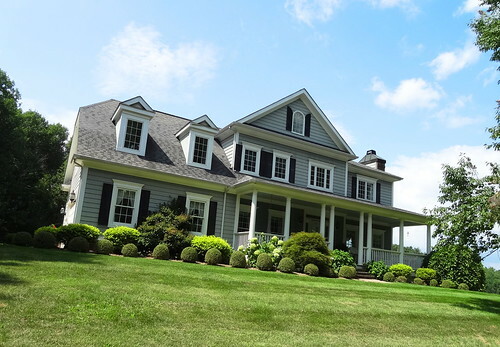 We turn in off of Atkins Rd to find a farmhouse-looking-building in saddle brown with red trim with a breathtaking view of 22 acres of farmland, an 11-acre vineyard and lush green pastures. The 60′ long outdoor patio is empty today, I imagine it’s in high demand on the weekends. 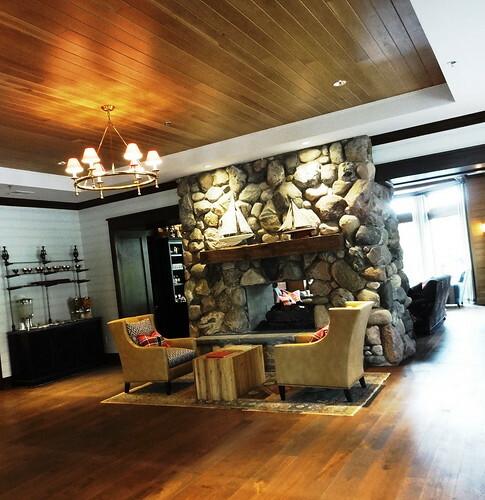 The quaint interior is done up in wood, stone and warm colors. 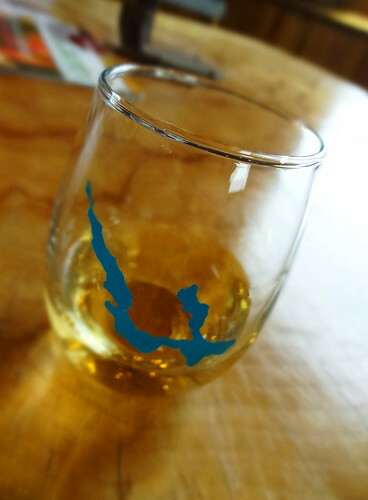 One of the owners is behind the bar, we strike up a conversation immediately; turns out they relocated from Rochester MI to Petoskey to take on this amazing adventure. 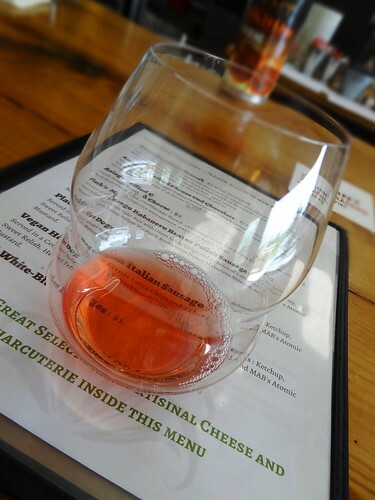 You can’t go wrong with a Michigan Riesling, the 2016 Whitecap is really nice too, but the 2017 First Crush, an Estate Sweet Rose is the one we’ll take home. 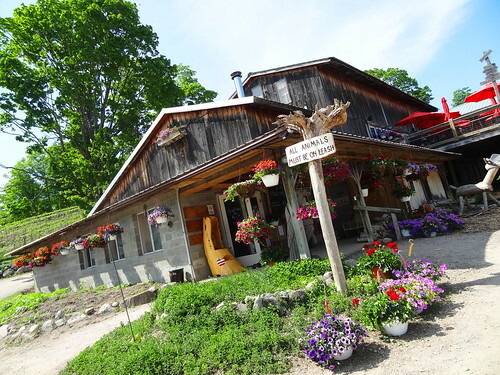 Walloon Lake Village is just a hop and a skip from here, when we asked for local restaurant recommendations Barrel Back was suggested every time. This is our first visit to Walloon Lake, I’m looking forward to checking it out after we eat. 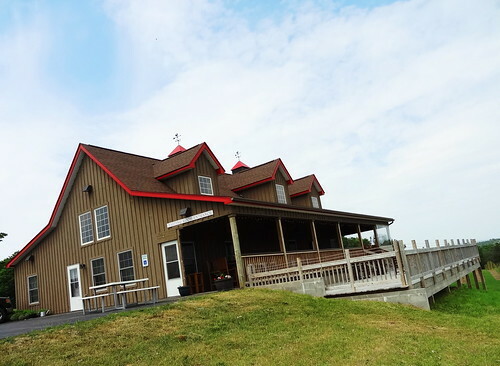 Barrel Back Restaurant sits on the shore of Walloon Lake, the building is shared with a marina; the restaurant is on the upper level, the lower level is Tommy’s, a water-skiing and wake-boarding Pro Shop. 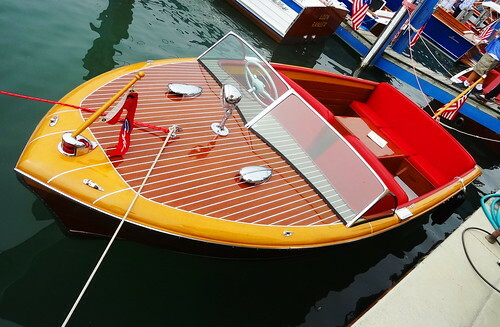 The term ‘barrel back’ refers to the boat design of the 20’s, 30’s and 40’s wooden boats, think Chris Craft. 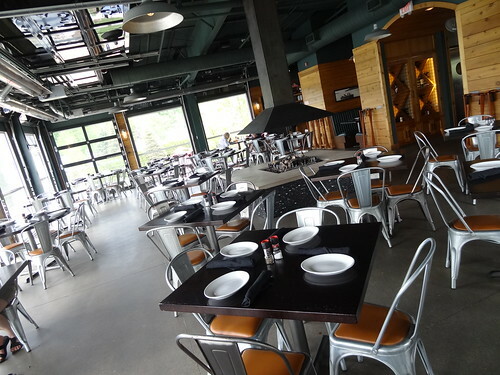 The restaurant has indoor and outdoor seating, we opt for the patio, looking around I think you have a view of the lake from anywhere you sit. Food is prepared using a number of wood-fired appliances including a pizza oven, grill and a rotisserie smoker. We order off the happy-hour menu and are eating in no time. 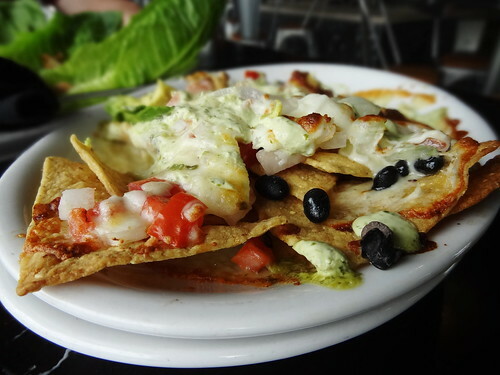 The black bean nachos are topped with tomato, sweet onion, pepper jack and provolone cheese, salsa and cilantro-lime sour cream, yum! 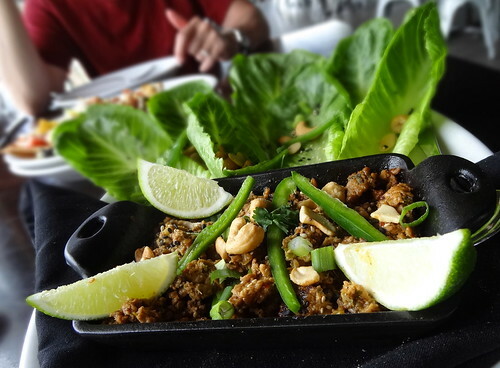 The Asian lettuce wraps are equally delicious, Asian-spiced ground chicken, peppers, cashews, black sesame seeds and romaine lettuce to scoop it into. I’m so glad we found about this restaurant. 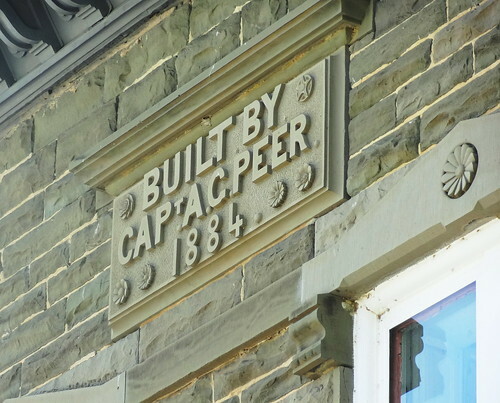 A little Walloon Lake history. 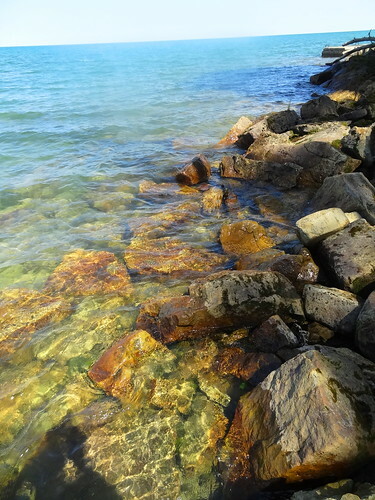 The lake itself is glacier formed, they say the water is so clear you can see the bottom 30′ down. 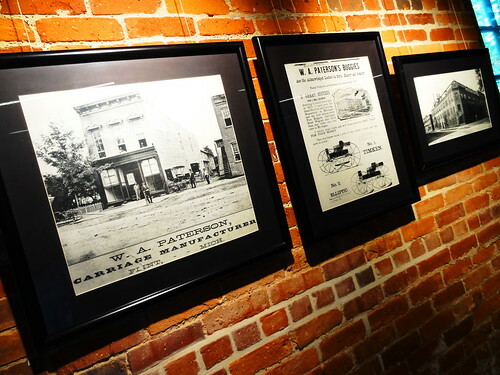 The late 1800’s were the heyday of Northern Michigan’s lumber industry, over a 20-year period all of the White Pines were cut down, the industry then moved south to hardwood forests. That left railroads with trains and nothing to transport, hey, how about people? 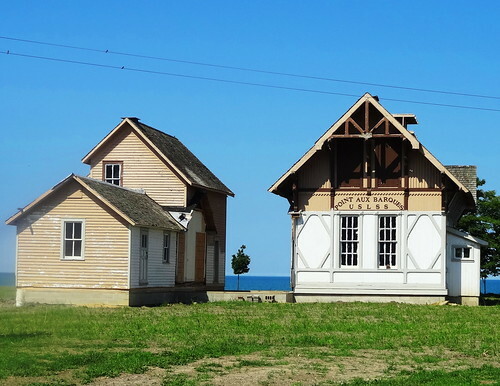 The railroad companies turned northern Michigan into “Vacationland”, they built hotels and resorts creating a destination for city folk to escape the summer heat. 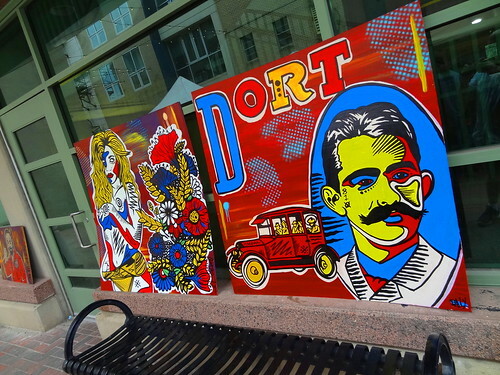 They ran publicity campaigns drawing people from Cincinnati, Indianapolis, St Louis, Kansas City and Chicago. 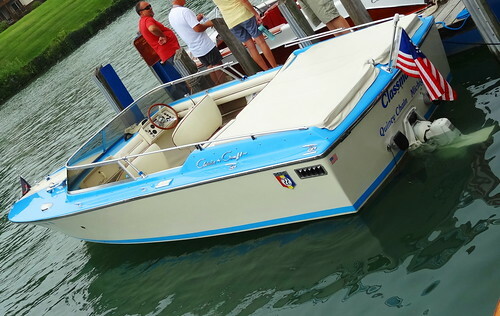 They touted crystal clear water, beautiful views, great fishing and boating. In 1891 Walloon Lake Village was accessible by a spur from the main trunk line of the railroad. People came, and they continued to come, year after year, many built their own cottages, visitors became residents. Ernest Hemmingway’s family had a cottage here, he spent his first 22 summers at Windemere on Walloon Lake. He often used the area as a setting in his short stories featuring Nick Adams. The cottage is still owned by the Hemmingway family. 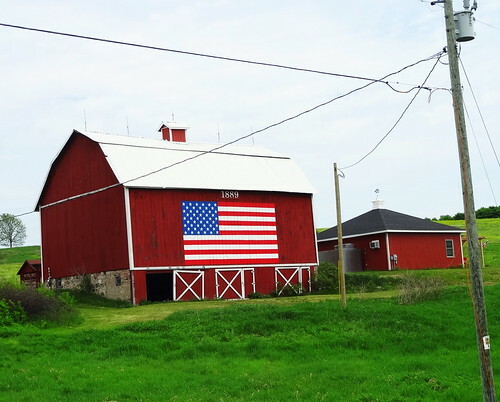 The village was hit hard by the most recent recession and a number of other ongoing factors. Developer Jonathan L Borisch stepped in and rescued the village where he spent his childhood summers. He and his son have opened retail shops, Barrel Back Restaurant, many businesses and the 32-room Hotel Walloon; let’s go inside. From the street you’d swear this was a historic hotel, the architect did a marvelous job capturing that back-in-time elegance that’s so sorely lacking today. 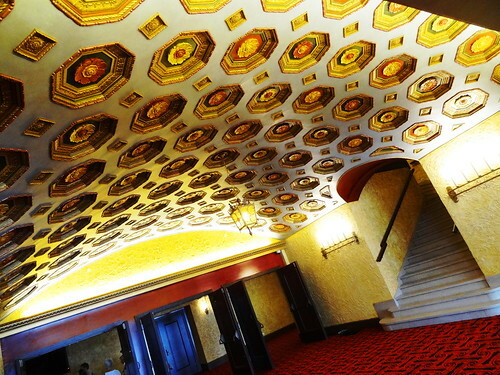 The lobby is a wonderful blend of old-fashioned opulence and modern flair. 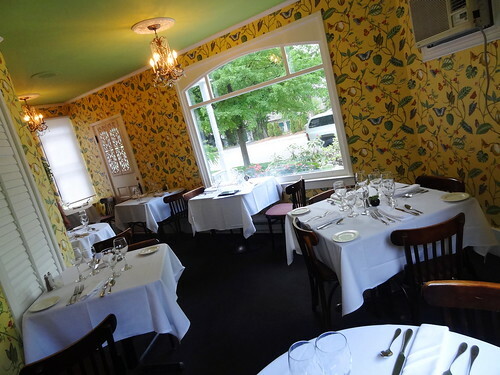 To the right is a lovely seating area with turquoise-painted wood panels and ceiling, bold fabrics and a red-clad chandelier, I feel like I’m on Mackinac Island. The hotel manager spots us and comes over, we explain that we’re ‘just looking’, we are offered a tour. The hotel is stunning, everything is gorgeous, impeccable, every last detail has been thought of. 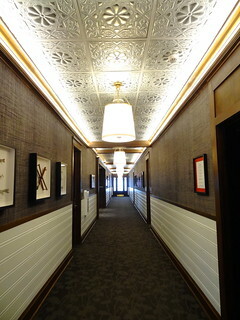 The hallway to the elevator features wainscoting and tin ceiling. 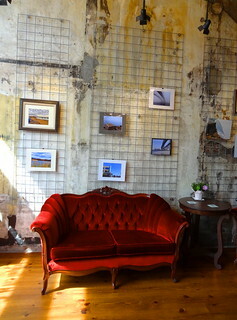 Rooms are spacious, comfortable and inviting, there’s an underlying historical feel in the space. Lots of painted wood, wainscoting and serene water views. Instead of taking the elevator to get back to the main floor we opt for the stairway through the hall of mirrors. We’d love to come back and stay at the hotel. 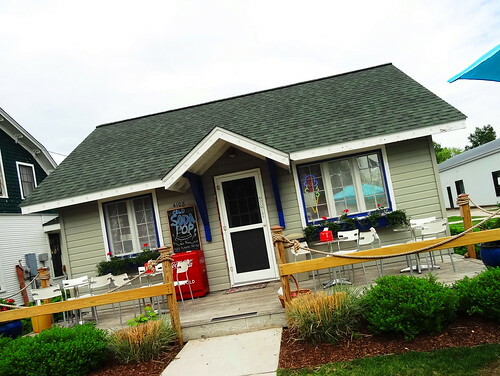 Across the street are a few small businesses, the antique and sweet shop are both original cottages from back in the day. 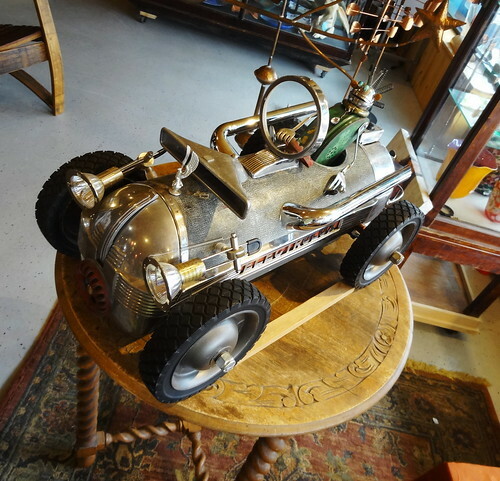 We take a look through Vintage Mercantile, they have an eclectic mix of items from vintage toys to glassware, metal signs to furniture; I like the old wagon out front. Sweet Tooth lives up to its name; candy, ice cream, fudge. There’s an old-fashioned ambiance here; glass jars filled with colorful candies, pretty wooden shelves, antiques here and there; a black and white photo shows the cottage back in the 1940’s. You can even purchase a shovel and pail for playing in the sand. Of course it wouldn’t be vacation without ice cream… We take one more look at Walloon Lake, the sky has become overcast, the sun hidden behind the clouds, the water placid. 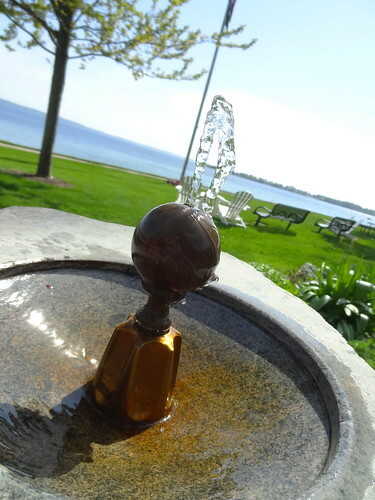 Northern Michigan is filled with treasures from charming small towns and magnificent lakes to picturesque landscapes and did I mention wine? We start our morning on Sturgeon Bay It’s Tuesday, a normal day for the rest of the world, kids are in school, folks are at work, there’s not a soul around. We park along the side of the road and walk out to the lake, the only sound we hear are waves lapping at the shore. 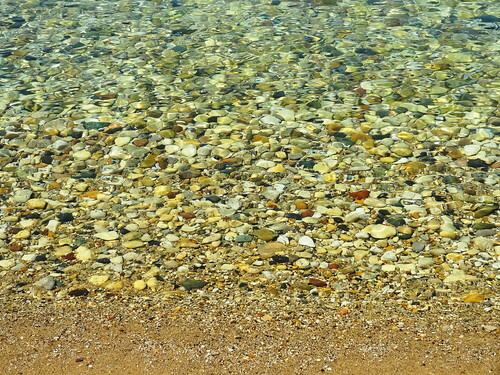 I reach down into the crystal clear water, it’s cold. Yellow butterflies flutter around our heads then cluster together on the sand. After a time we drag ourselves back to the car and make our way south. 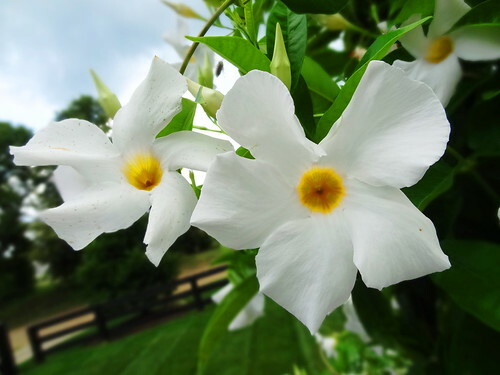 We drive through the Tunnel of Trees, M119, one of the most scenic drives in Michigan; high upon a bluff, Lake Michigan on our right, a sea of Trillium on our left. 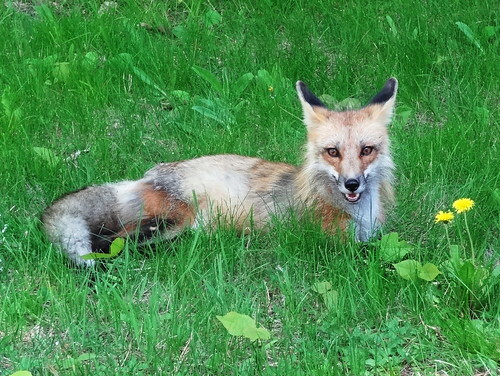 There’s something in the road ahead, Kris comes to a stop, it’s a fox, he trots casually across the narrow road, finds a comfy spot in the tall grass and makes himself at home. 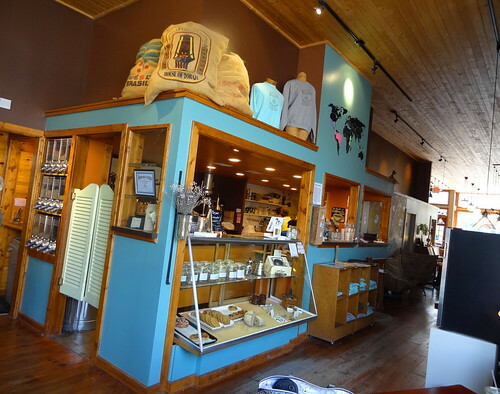 Just ahead is Trillium Woods Vintage Boutique and coffee shop, we grab a couple of espresso’s and continue. 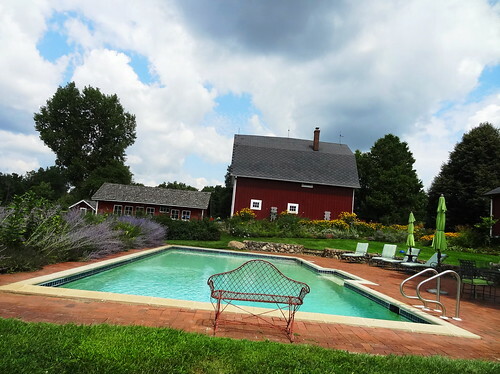 Pond Hill Farm is home to a winery, brewery, cafe and farm store; open year-round it has become an agritourism destination. We turn in off of M119, parking is plentiful. 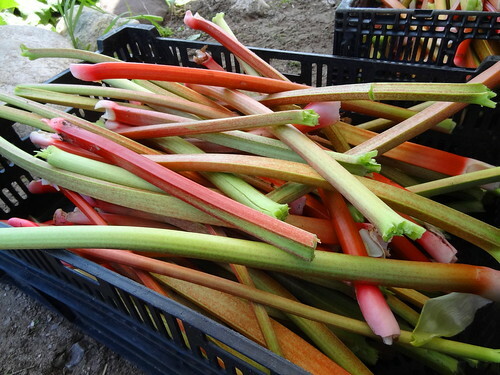 Walking toward the rustic buildings we stop and watch as a group of girls pick, rinse and pack fresh rhubarb. Look at those stalks, the fade from green to red, we stop to talk, when offered a taste I eagerly accept; it’s kind of tough on the outside but I manage to bite through, the inside is tart but pleasant, not bad. 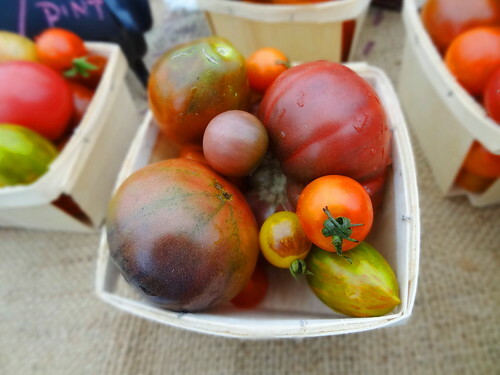 The market is loaded with goodies; fresh produce, wine, beer and rows and rows of canned goods made from scratch. You’ll find the usual jams, salsa and veggies but have you ever seen IPA Beer Jelly or Cherry Wine Jelly? I pick up some blueberry jam and a bottle of Spicy Peanut Sauce then join Kris upstairs. Cafe diners are eating on the deck on this beautiful day, we round the corner to the tasting room and take a couple of seats at the bar. 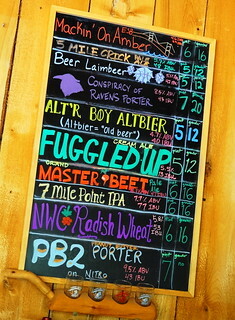 Today’s beer list has some interesting offerings, we’re here for the wine. We taste several then order a glass of the Schoolhouse Red, it’s so good we buy a bottle for home. Outside we walk over to the vineyard, the vines are just coming to life as new leaves emerge on woody vines. 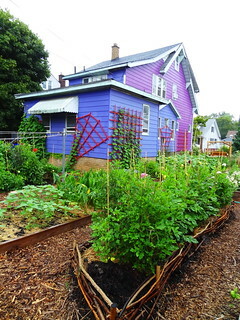 Fields are mostly bare, greens grow robustly in the greenhouse. 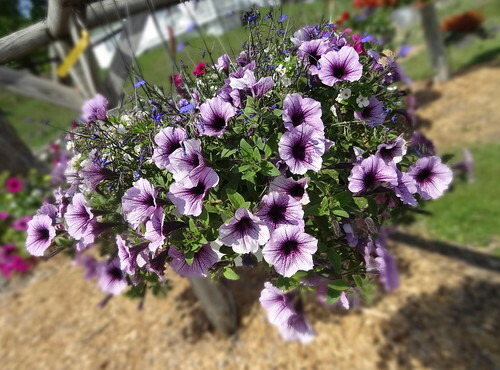 Baskets of flowers are everywhere, customers come and go in a constant stream carrying away Petunias, Geraniums, Begonias and Lobelia. 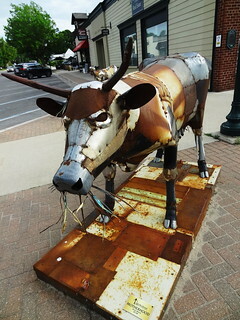 About 5 miles down the road we find ourselves in downtown Harbor Springs. There’s this amazing area we keep wanting to check out called Wequetonsing, today is the day. Back in the late 1800’s We que ton sing (as they wrote it then) was originally a Presbyterian summer resort, in 1880 it changed hands so-to-speak and became a private association. I found the original By Laws of the association online, I love some of the descriptions, “the water approach to the grounds presents a picture of rare beauty; they rise from the water in gentle terraces, and are covered with a luxuriant growth of young trees in great variety…” how about “a safe and healthful place for families to reside during the heated season”. All are true. 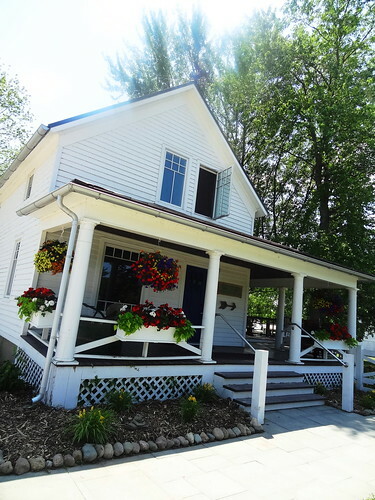 By 1888 12 trains passed daily during resort season between Petoskey and Harbor Springs with a stop at Wequetonsing, they had a train depot and a pier for small steamers, a large hotel had a dining hall that could seat 200; there were about 40 cottages built by that time. I imagine women with parasols and large hats, kids splashing in the water, men in suits and ties strolling the sidewalks. Though many things have changed, the beauty and the elegance, not to mention the magnificent cottages, still remain. 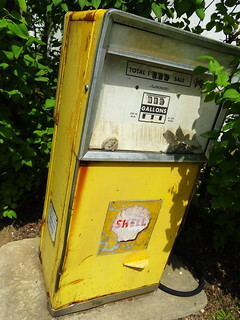 A walk along Beach Drive is like going back in time. Going south you have a panoramic view of the north side of Little Traverse Bay on the right and stunning, historic cottages on the left. 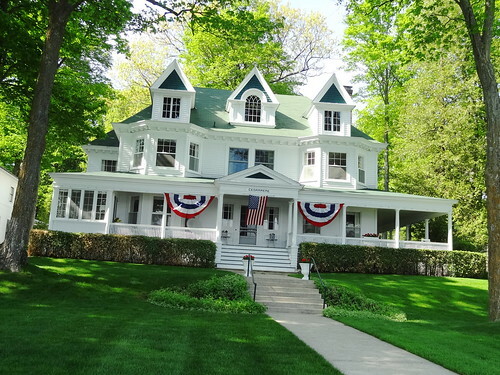 The cottages are immaculately kept; freshly mowed grass, porch boxes and planters filled with newly planted annuals, an American flag billows in the breeze. I will generalize and say most buildings are built in the Victorian style of architecture, there are definitely exceptions. 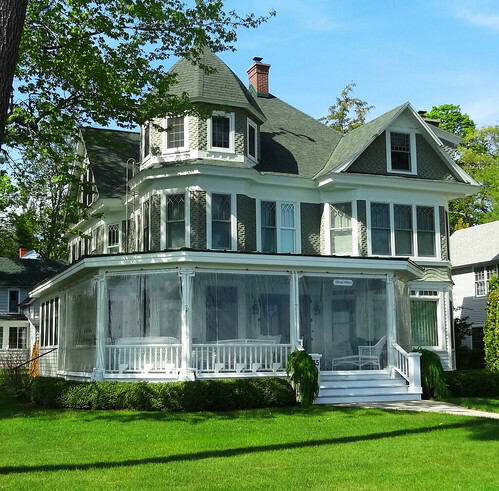 Porches are large and can support several seating areas for optimal water views. Some cottages are still wearing their winter clothing, closed off with heavy visqueen sheeting. Craftsmen are hard at work making repairs or renovating before the summer season officially begins. 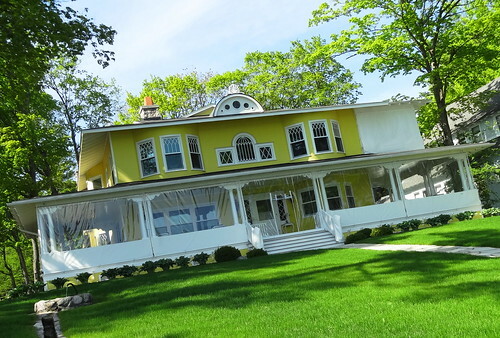 White is the exterior color of choice, you’ll find some houses with a splash of color; spruce green, navy blue and a few in yellow. Lawns are deep green, trees and shrubs are filling out after the long winter; I find myself looking from side to side, lake-cottage, lake-cottage. Each home is unique; balconies, turrets, wide staircases, stone, fancy railings, look at that one with the bunting, oooh, this one has Geraniums lining the lengthy walkway, that yellow house is different, low and wide, look at that eyebrow window with the portholes. Some of them have names, I think Cedarmere is my favorite; a majestic beauty overlooking the shoreline. 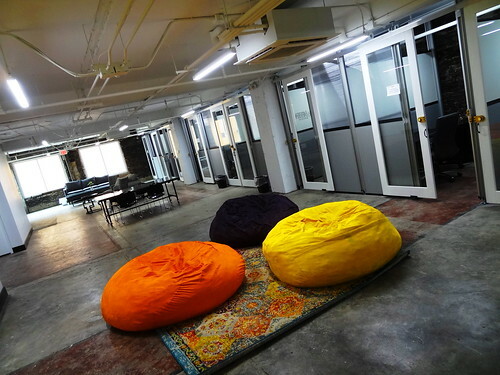 Common areas include a croquet court, I recognize the familiar sound of the mallet striking the ball. Three gentlemen dressed in white and wearing hats have just finished a game; now that it’s empty I can get a closer look, they have the same grass as a golf course for the court area, fancy white wickets pushed into the ground are all that remain of the game. This community was built during America’s industrial dynasty, I’m so happy to see it preserved. 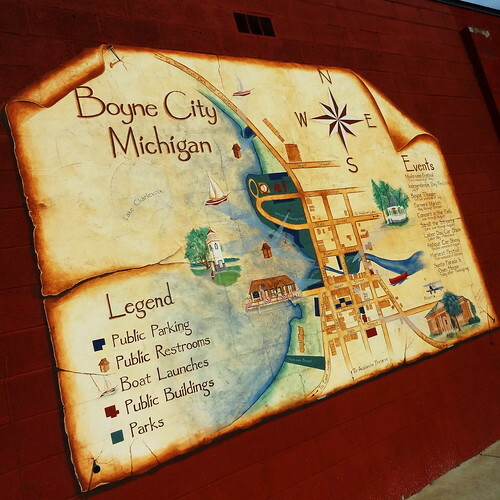 Our next stop on the tour is Boyne City There have been a lot of changes over the last decade. 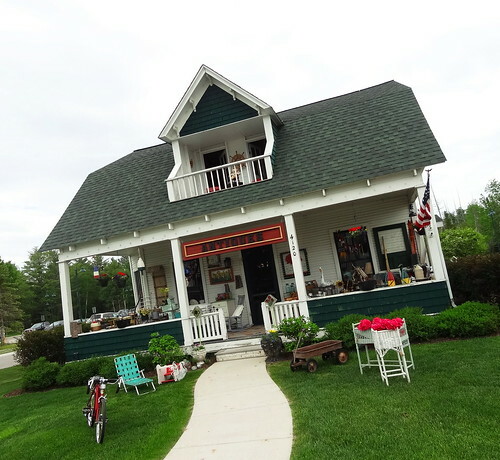 Despite being located at the southeast end of Lake Charlevoix, the quaint little town had become stagnant. 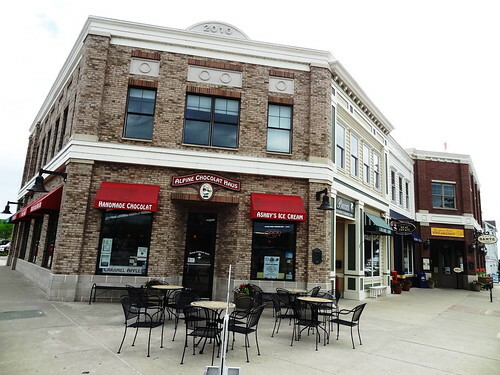 Local small businesses in the southern section of Boyne City came together and created the SOBO District, the city invested in itself and became a Main Street Community; downtown was revitalized, buildings restored, new development came in retail and residential. 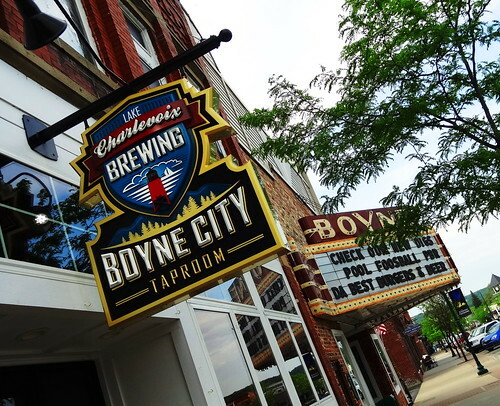 Boyne City is once again vibrant and active. 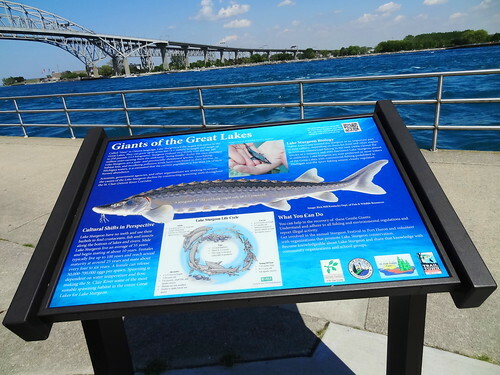 There are 11 miles of lake frontage, parks, beaches and a boardwalk. 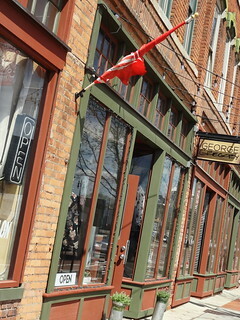 Downtown is home to boutiques, restaurants, a bookstore, galleries and coffee shops. It’s getting late, most of the shops have closed. 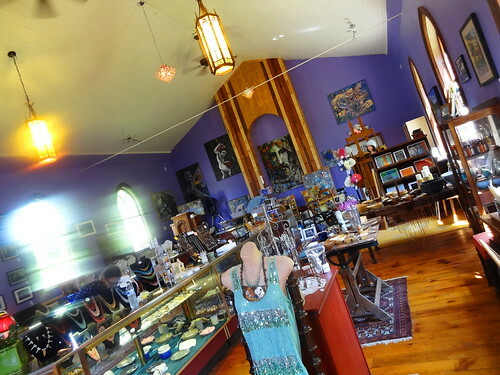 Freshwater Art Gallery’s doors are still open, fabulous things are everywhere. 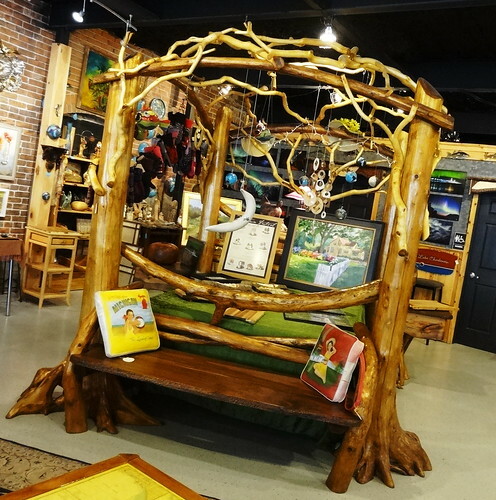 The one-of-a-kind bed is a real attention grabber, look at it, all handmade from wood and branches, imagine the dreams you’d have sleeping in it. 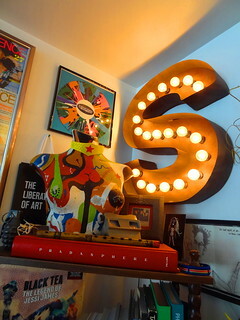 Metal art, jewelry, glass, baskets, clever lamps. Kris likes the painted Up North scenes, the Northern Lights photos are very cool. 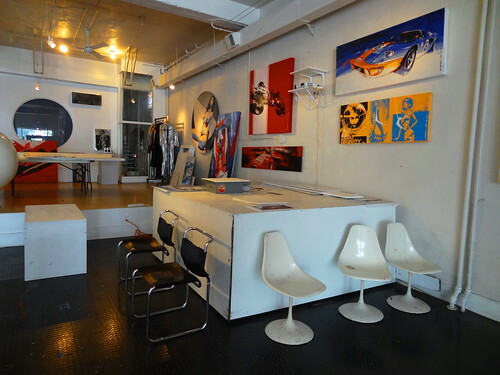 The gallery also doubles as a concert venue. We walk around taking note of the lovingly restored buildings and public art, I’m thirsty so we drop in at Lake Street Market. 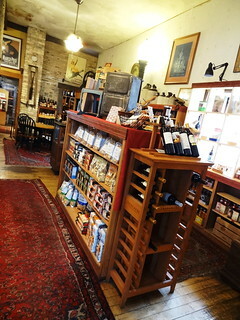 This place has everything, food, drinks, cheese, baked goods, wine, art, and it has great rustic charm. 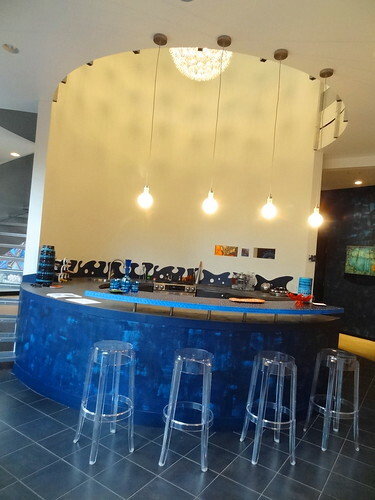 Before we go we visit the Alpine Chocolat Haus, it’s just not vacation without ice cream. I can see we need to come back and spend more time here. 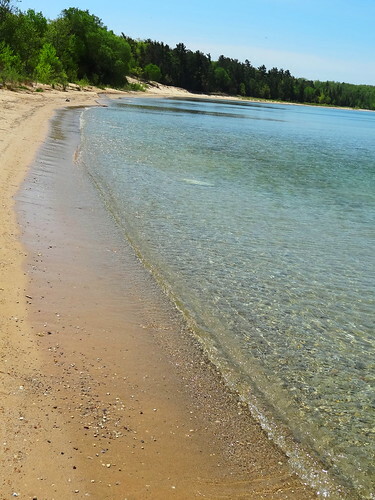 Time to get back to Charlevoix The Beautiful. 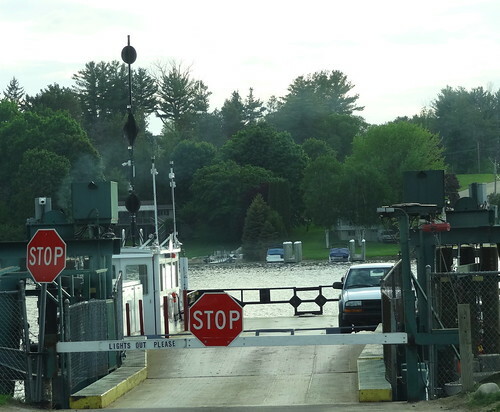 The shortest way to get there is to take the Ironton Ferry from Boyne City to Ironton; it crosses the south arm of Lake Charlevoix at a very narrow point. 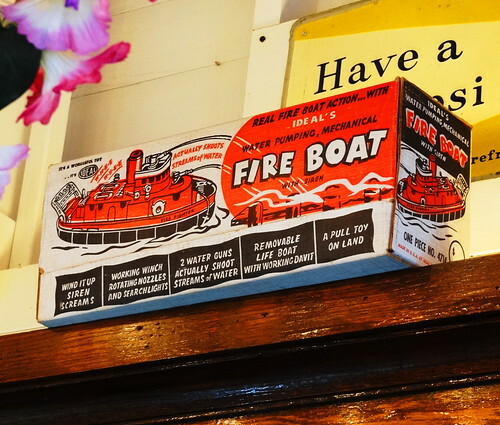 The 4-car ferry has been in operation since 1876, in those early days it was powered by horses; the onboard gates were electrified in the late 1970’s. We’re in luck, the ferry is on its way back and we’re first in line. The fare is only $1 today and worth every penny. I love that this ferry still exists. We reach Ironton on the other side, we’re about 5 miles from Charlevoix. 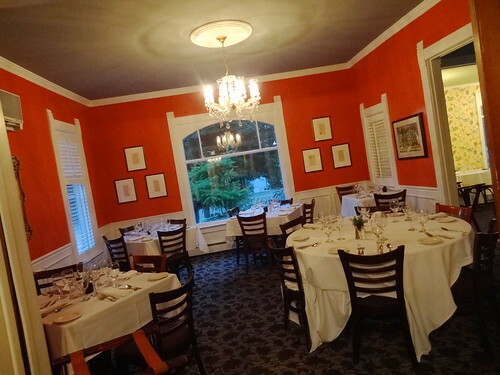 Back at Abide we freshen up and put on nicer clothes for dinner at Grey Gables Inn Restaurant. 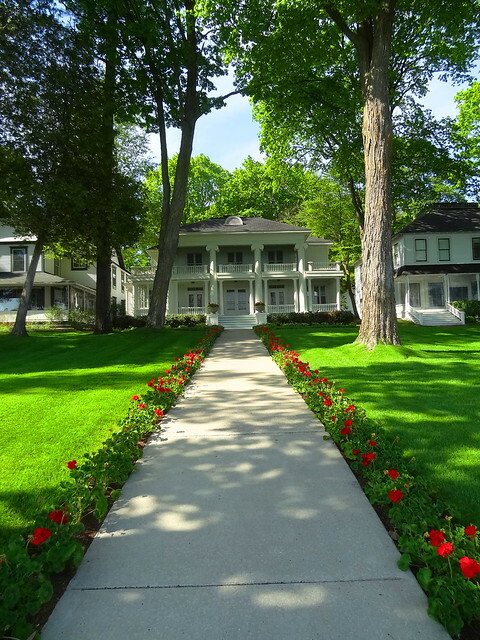 Grey Gables is located in the Belvedere Club, like Wequetonsing, the Belvedere Club started out as the exclusive Charlevoix Resort Association in 1878, cottages continued to be built and in 1923 the name was changed to The Belvedere Club. The restaurant and Inn are original cottages from the 1930’s. 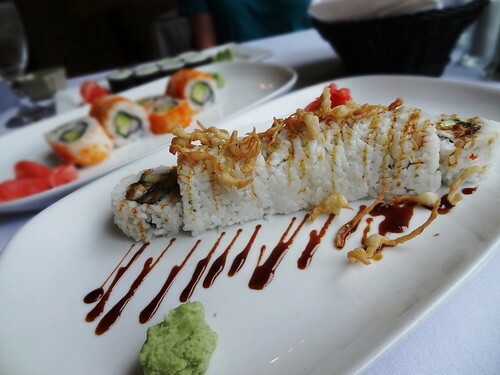 Tonight is sushi night at Grey Gables. The restaurant is lovely, decked out to the max in Victorian decor; floral wallpaper, bold colors, frilly crystal chandeliers. 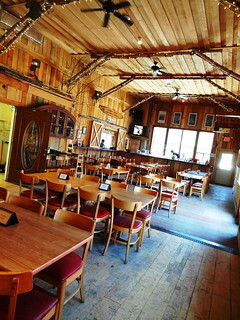 The staff is friendly, servers attentive, at this time of year most of the patrons are local. We order 3 sushi rolls, while we wait our server brings us a bread basket, clearly he could tell we were hungry. We polish off the bread just as the sushi arrives; nothing fancy, a veggie roll, Sunny and an M-80, all was fresh and good. It has been a full day of beauty and delight. It’s hot! 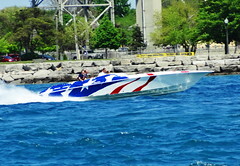 When Mother Nature turns up the heat Port Huron is a great escape. 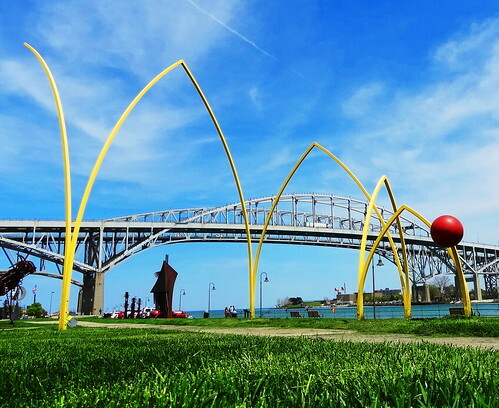 Known as the Maritime Capital of the Great Lakes, Port Huron offers waterfront parks, beaches, a river walk and breathtaking views of Lake Huron on 7 miles of shoreline. 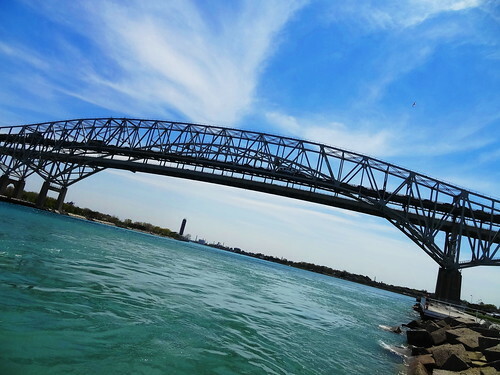 We drive straight to the Thomas Edison Parkway, this is where the St. Clair River and Lake Huron meet, the iconic Blue Water Bridge provides a spectacular backdrop for photos as it connects the United States to Canada. 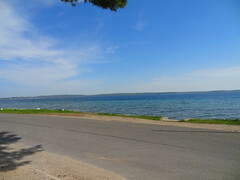 We park the car and begin our walk toward the bridge; it’s a gorgeous, sunny day, a cool breeze blows in from the lake. Fishermen have baited their poles and locked them into place, a bell will signal them if there’s activity on the line, a net is kept close by in anticipation of catching a big one. 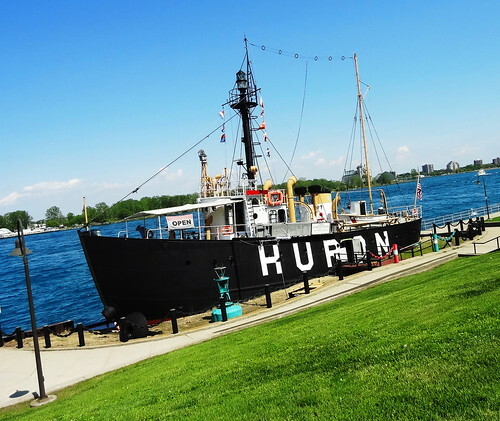 We pass the lightship Huron, once a floating lighthouse, now a museum ship. 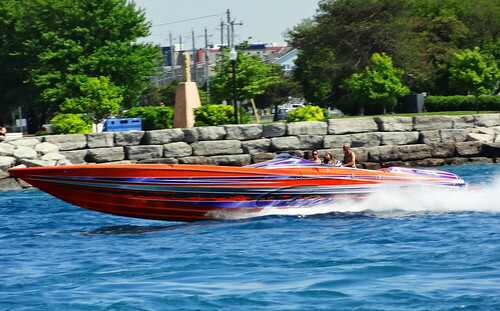 Power boats wearing fancy paint jobs zip by at speed, there’s some pretty big ones out here today. The girls on the Jet Ski look like they’re having a blast. Signs are posted here and there along the riverwalk filling us in on interesting facts about the area. 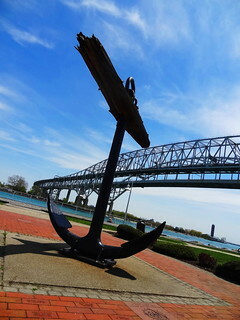 Did you know Port Huron is located at the 43rd Parallel? That means when I am standing here I am actually closer to the Equator than I am the North Pole. 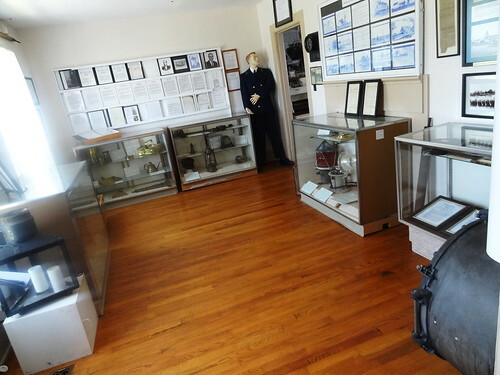 Thomas Edison moved to Port Huron with his family when he was 7 in 1854, the St. Clair River is 39 miles long, oh, and the water that flows through the Great Lakes ends up in the Atlantic Ocean. You can also read about native fish, shipwrecks and sacred grounds. 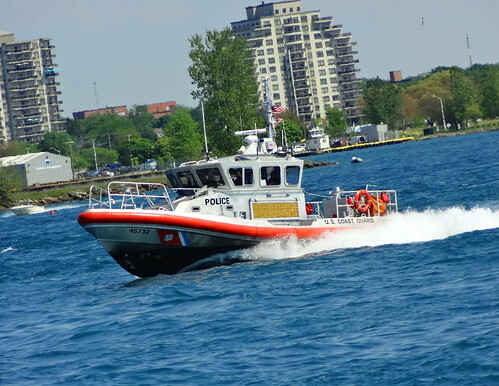 A Coast Guard boat is keeping an eye on all of the activity, a diver down flag bobbing on the river’s surface tells us a scuba diver is looking for sunken treasures below. A train moves slowly down the waterfront track, I bet it just came from the Domtar paper mill. 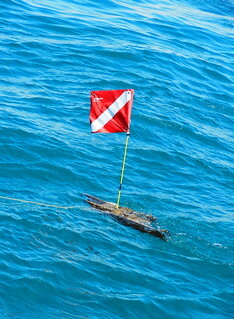 The anchor is from the John S Martin which sank in 1900. A monument dedicated in remembrance of the Great Storm of 1913 stands on the other side of the train tracks; 19 ships and 250 lives were lost in the storm, an additional 50 ships were damaged. 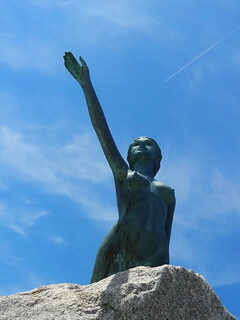 On the north end of the parkway is my favorite statue, the Blue Water Maiden, she was moved here in 2010 and greets all who travel the waterway. 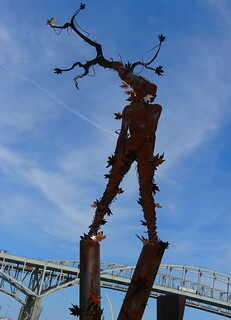 The Midwest Sculpture Initiative (MSI) has put together a sculpture exhibition along the riverwalk for the last 3 years. 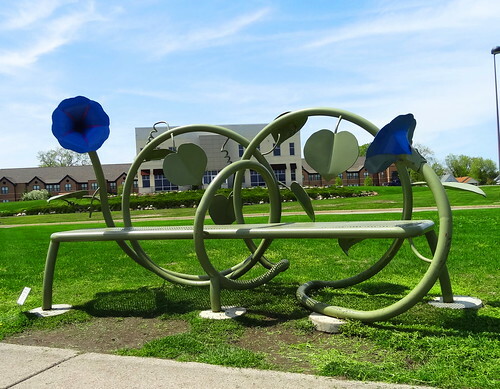 Ken Thompson, an artist and sculptor himself, formed MSI to provide innovative exhibitions that feature outdoor sculpture throughout the midwest. Let’s take a look. 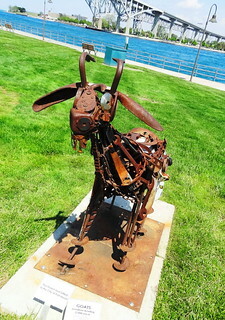 I stand in one place and look out over the open-space gallery, bright colors, geometric shapes,rusty, shiny, large forms and goats fill my sight. In no particular order Kris and I traverse the landscape to see each piece. 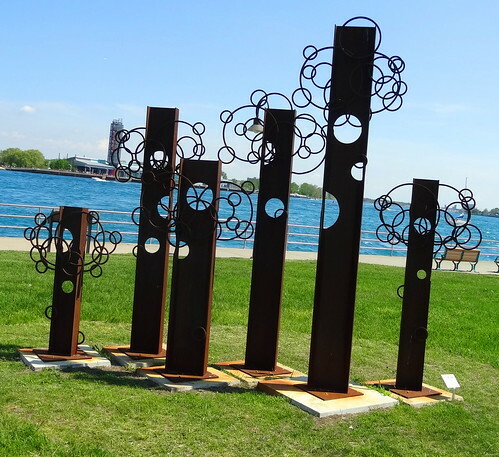 6 metal forms are grouped together to form Old Orchard, I think they’re apple trees. 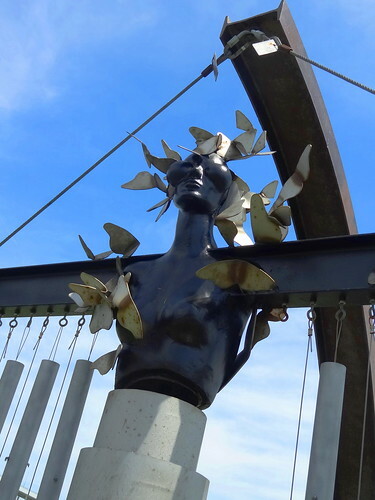 Crescent Song has a coyote howling at the moon, I follow the sound of wind chimes to Madame Butterfly, look at all the butterflies gathered around her head, she looks happy. Each sculpture has a plaque with the name of the piece, the name of the artist and the price, some names are obvious; Curves, Falling Pyramids, R&B. I like the colors of Red Green Construction, I totally follow the yellow bounce of bouncing ball. A close look at the goats reveals found objects integrated into the sculpture; chains, wrenches, a hood hinge, what do you see? Icarus is a complex piece, a figure hangs by delicate fingers from a bar, unattached wings to the sides, the expression somber. There’s a horse on a rainbow and a whimsical figure named Daphne who has a tree growing from the top of her head, I bet the kids love to play on the Morning Glory Whisper Bench II. 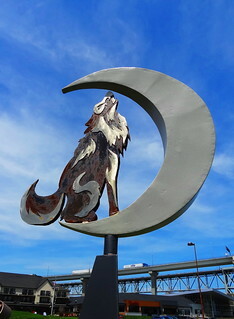 If you like sculpture be sure to check out MSI’s website to see other exhibitions in the midwest. 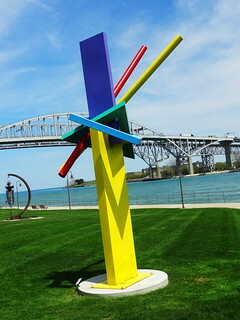 If you’re looking for more Michigan art, check out the MI Amazing Art Tour app, available for iPhone and android. 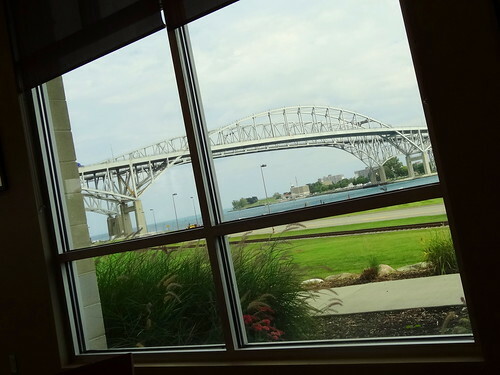 We’re having lunch downtown at the Port Huron Office Center building. Rix’s Roof Top restaurant owned and operated by a local family, is located on the 6th floor, this is actually the old Fog Cutter space, ring a bell? 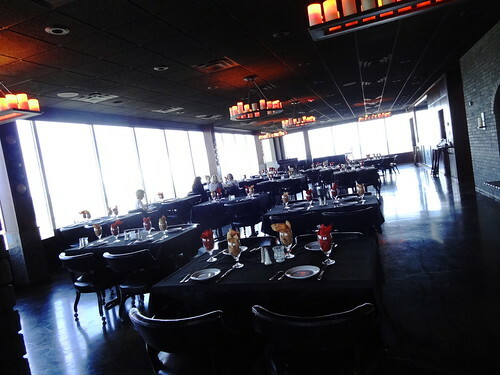 The elevator takes us to the top floor, the dining room is surrounded in glass, chandeliers of electric candles glow dimly, ceiling panels are black, the floor is dark, the decor is the panoramic view outside the windows. 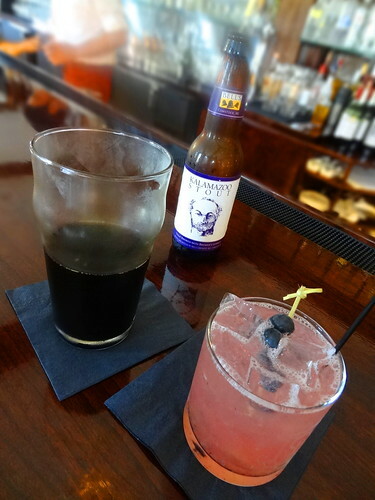 We’ve arrived during Happy Hour, well drinks are just $2. When the cocktails arrive we place our order, we watch freighters pass while eating warm bread slathered in butter. The burger and steak bites arrive together as we requested, the food is good; steak bites are tender, burger is prepared well. The service was great and the view unbeatable. 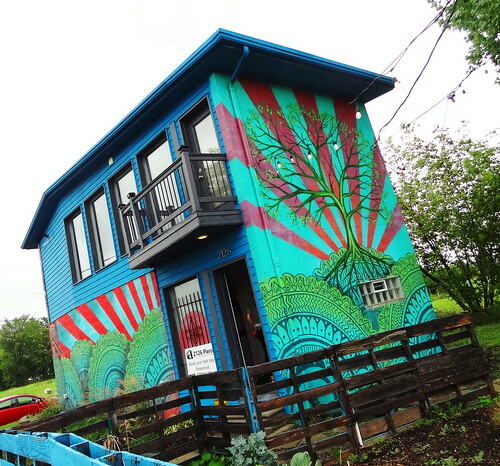 The Exquisite Corpse Coffee House opened in 2012, last December new owners Maggie and Nathaniel took over and have really made the place their own. 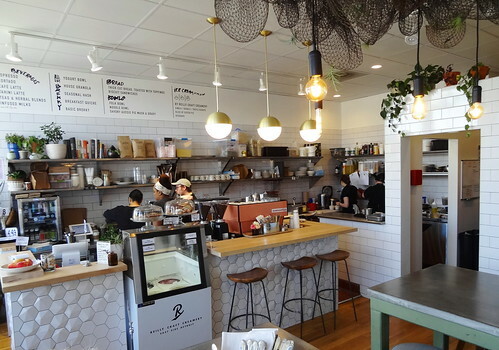 The space is beautiful, warm, welcoming, the coffee is excellent; they have added baked goods, light sandwiches and bagels to the menu. Art is still in the front part of the space, works are by local artists, a counter in the front window allows patrons a glimpse of the goings-on outside. Choose a seat at the large community table or relax in a comfy chair, play one of the many available board games with friends. 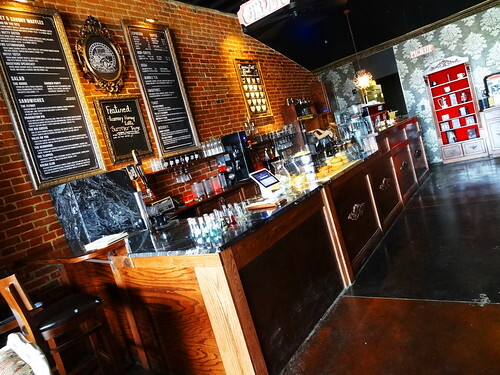 There’s always something going on in the coffee shop these days; ballroom dancing lessons, yoga, magic shows, music and hypnosis demonstrations. We’re here for the coffee and the company. 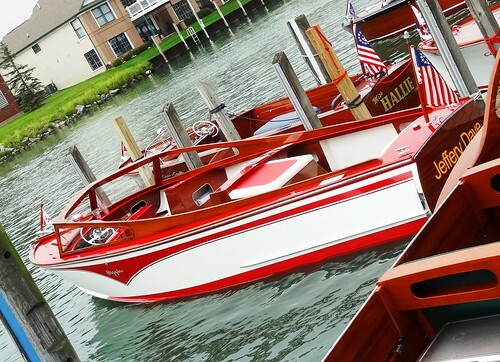 We drink our cold brews as we catch up on the latest Port Huron news; they’re making progress on the new City Flats hotel, new businesses are coming soon, Boat Night is July 13, the Port Huron to Mackinac Race is July 14, the International Boat Show is September 14-15. We prefer coming on just an ordinary day, the water is always blue, the breeze is cool, the food is good and the people are friendly. Detroit is a city known around the world for its past. 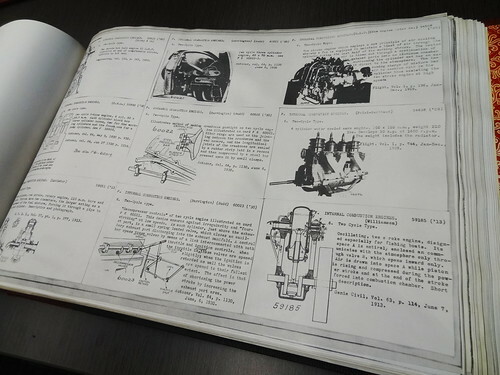 We were a manufacturing mecca; we built ships, stoves, war planes, we put the world on wheels. The city gave birth to Motown, Techno. We are known for Coney Island hot dogs, cocktails such as the Hummer and the Last Word. 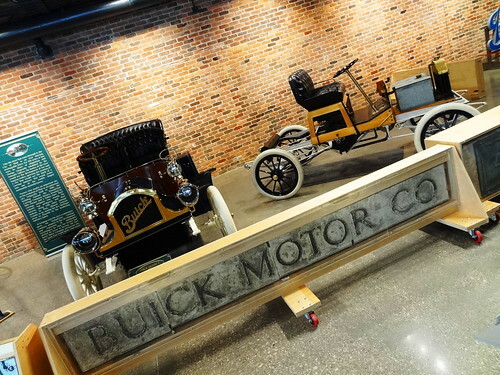 Detroit was a city of inventors, artists and beauty. For a while the lights went out in our bright city but the spirit of Detroit never dimmed. Here we are, reinventing ourselves, again. The world has taken notice, Detroit is on the lips of people across the country and across the oceans. Urban farms, amazing architecture, an international waterfront, award-winning chefs, builders, makers and artists; the past and the future colliding. Downtown is lively again, people crowd the sidewalks on Woodward, something new opens in Midtown every week, restaurants are lined up out the door; it’s hard to keep up. 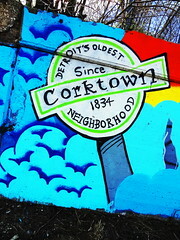 Join us today as we explore some of Corktown’s latest offerings. 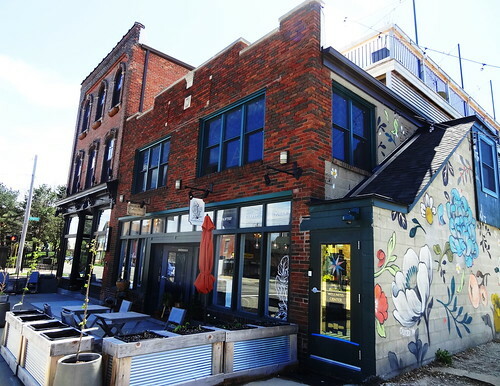 A couple of charming brick buildings reside at the corner of Trumbull and Bagley, it doesn’t seem that long ago an aging market occupied some of the space, the buildings in need of some TLC. Now the buildings have been restored and repurposed, patios host diners, flower boxes mark off the perimeter, pedestrians are a common sight. 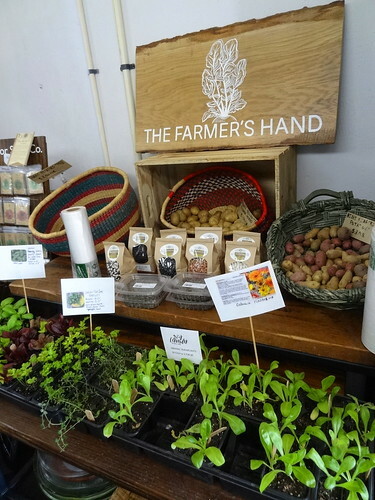 The Farmer’s Hand is a compact, gourmet grocery store with a busy take-out counter. 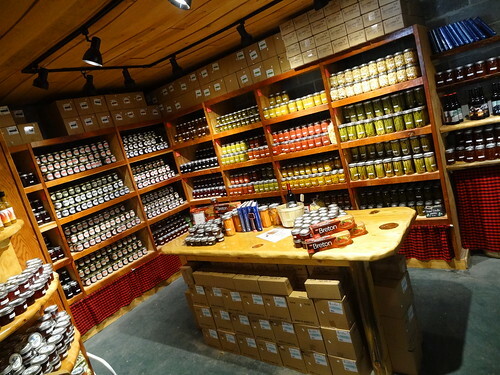 Fresh food and artisan products are all sourced from Michigan. 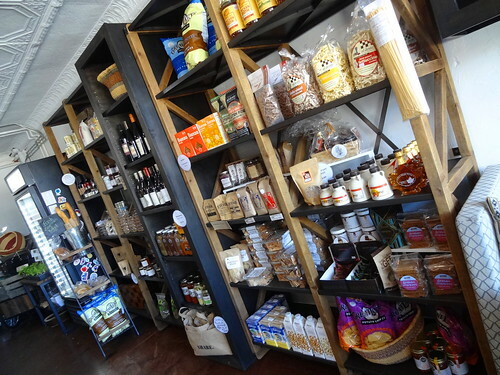 The space is quaint, like an old-time corner store, here you can purchase fresh produce, regional cheese, wine, healthy snacks, specialty products like Gus & Grey‘s Sweet Jesus Jam or My Funny Clementine Marmalade. Fresh flower bouquets are beautiful, the pastries look delicious, dairy, juice, water and a variety of sodas fill the fridge. 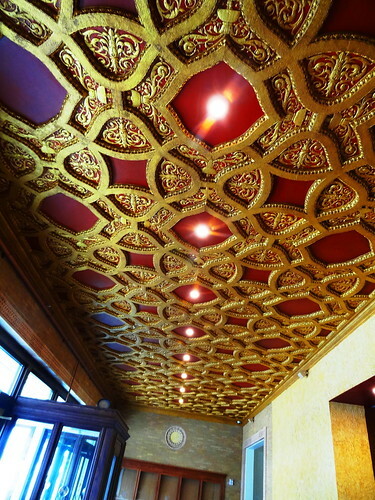 I like the old tin ceiling and the way everything mixes together creating a distinct aroma. 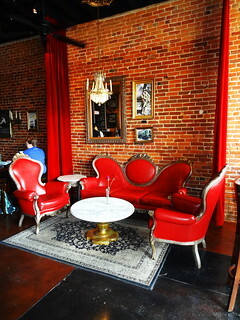 They serve Hyperion Coffee, grab a latte and sit inside or head to the patio. Next door is Mama Coo’s Boutique, I love this shop. 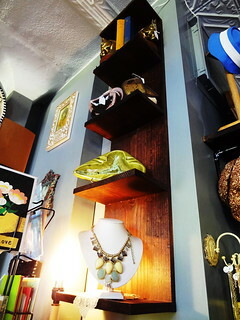 It’s kind of hard to describe; vintage, handmade, new, resale, art, themed pieces, all nestled together in one tiny space. 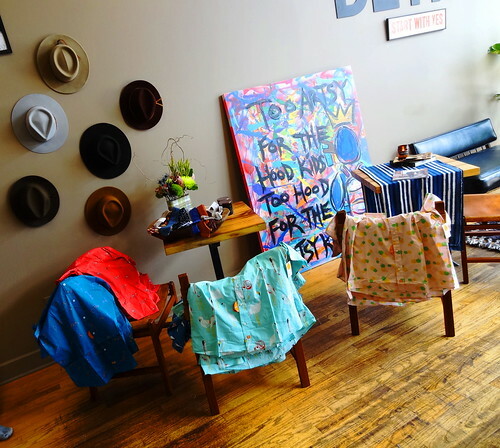 Owner Lana Rodriguez was born and raised in southwest Detroit, she’s done a fabulous job hand-picking items and arranging them into eye-catching displays. 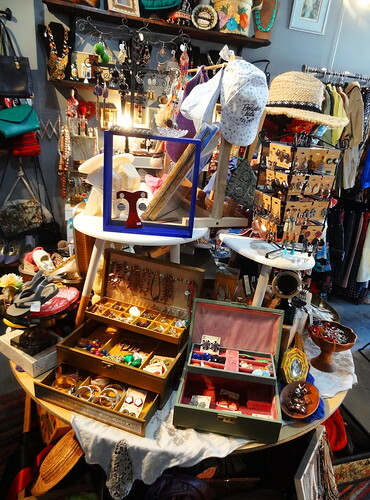 An antique trunk, old tables and shelves are filled with interesting things; roller skates, canisters, ceramic ash trays, handbags. I’m a fan of old jewelry boxes, I remember when I was growing up how much I liked opening my mom’s jewelry boxes, taking out the pieces and putting them back, arranging them by color or size–costume jewelry of course. 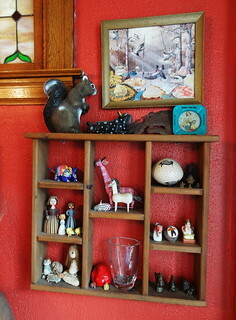 Racks of clothing, shoes, hats, knick-knacks, macrame, walls wear for-sale art. 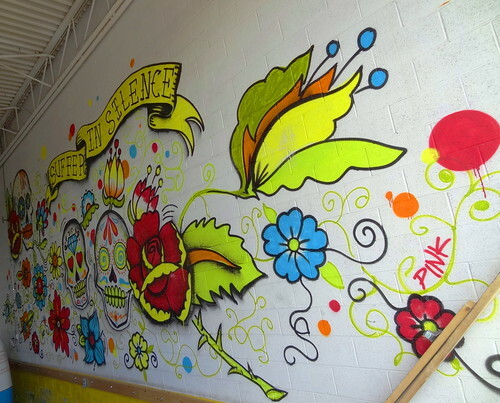 Southwest Detroit’s influence shows in Frida Kahlo charms, loteria and Mexican skull art. Every year Lana hosts a Prom dress drive and giveaway for local girls who otherwise would not have access to fancy, special occasion dress. If you have a prom dress, or two or three just sitting in the closet, consider donating them, there are so many girls who would love to have them. Did I mention I bought the cutest pair of hamburger earrings? Time to eat. 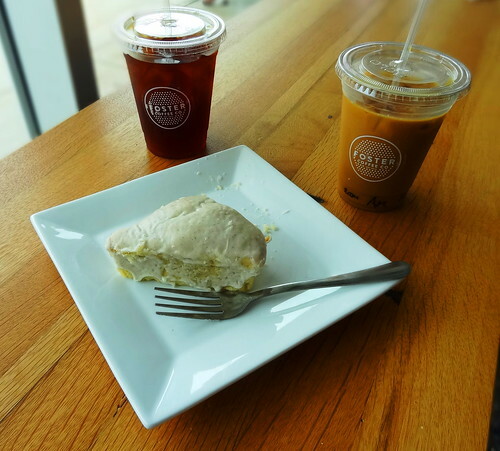 FOLK is an artisanal cafe serving seasonal, made from scratch comfort foods. The restaurant is an extension of The Farmer’s Hand and owned by the same ladies. 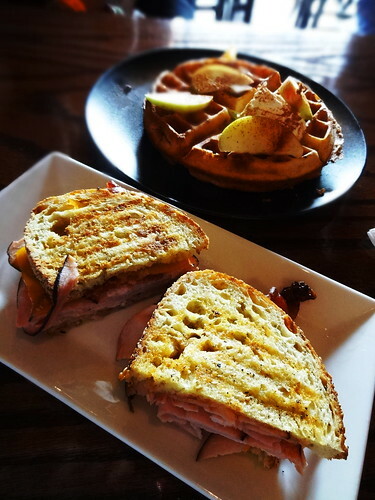 The restaurant is open until 3:00 pm and serves breakfast and lunch dishes. The corner space is light and airy, lots of white tile, live plants, communal tables, islands and a counter that overlooks the kitchen. 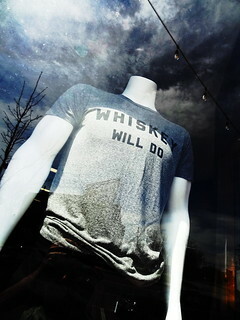 We sit in a sunny window and decide quickly what we want to eat. The restaurant is paperless so we are given a number held in a tall metal stand. 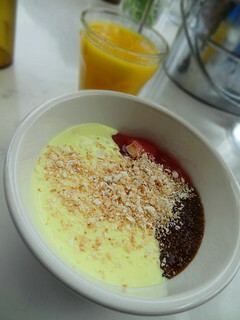 The yogurt bowl arrives first, turmeric tints the yogurt a pale yellow, a scoop of fruit compote and a helping of chia seeds complete the dish; it’s pretty tasty. 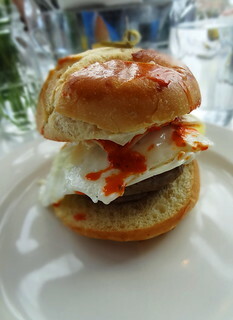 The Big Guy is a breakfast sandwich with two eggs, cheese and a thick sausage patty, drizzled with sriracha sauce, served on a soft roll. A little pricey, but good. We are sharing a table with 2 women, one is having the daily special the other some sort of ‘bowl’, everything looks good. 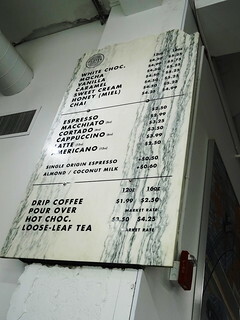 When we are finished we take our number to the counter where we are given a total and pay. 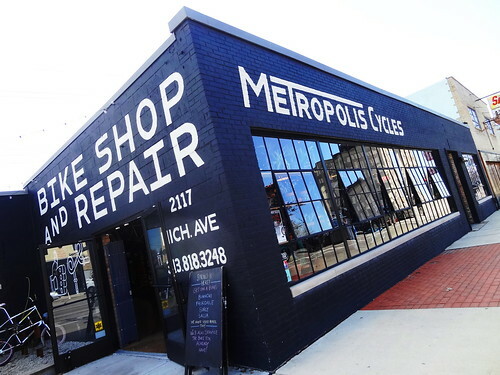 Over on Michigan Ave we pop into Metropolis Cycles, a full service bike shop. 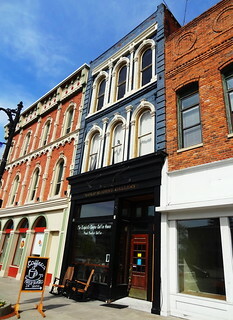 I really like this single-story building, the exterior brick is painted black and surrounds a large expanse of windows. Inside, bikes hang from exposed rafters, walls and stand in neat rows on the wood floor. 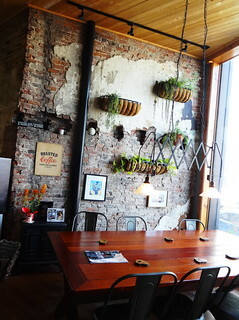 Exposed brick, antique wooden doors and potted plants make the shop cozy. 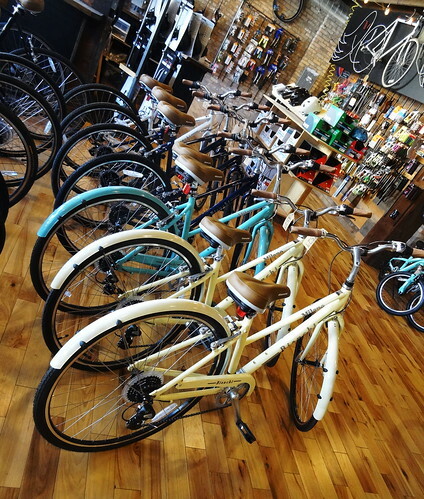 Customers browse the selection of bicycles by Bianchi, Surly, Raleigh and Fairdale, lots to choose from. 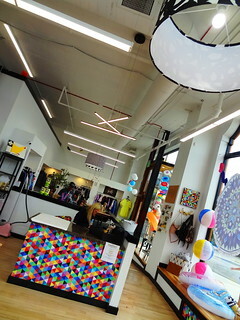 Accessories are plentiful along with bike shorts, pants and shirts. 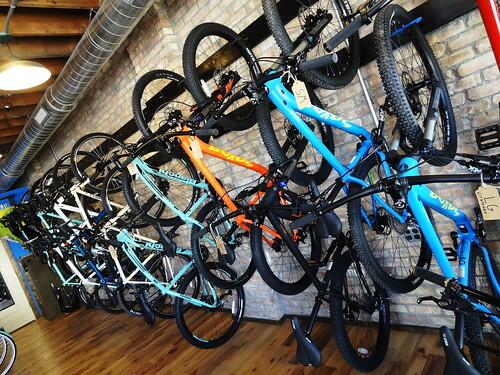 A guy drops off his bike for a spring tune-up, everybody is anxious to get riding after the long winter. 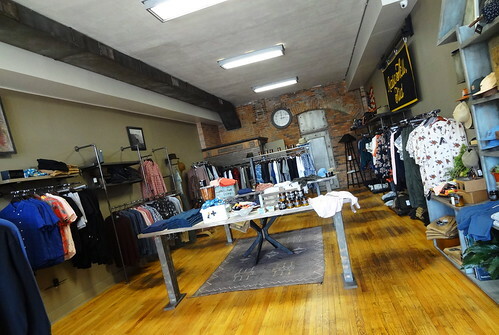 George Gregory is a men’s shop offering clothing and lifestyle goods. 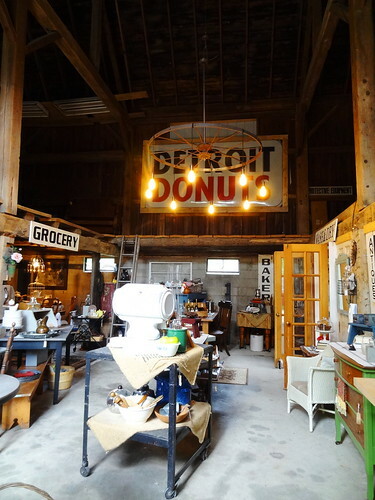 The shop is super-attractive, we are greeted by a sign that reads Hello Detroit, a bourbon-something-or-other candle burns on the counter and smells wonderful. 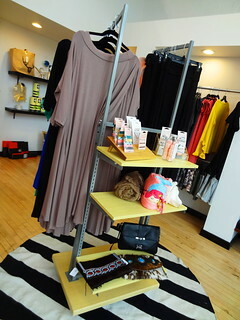 Items are laid out in a way that encourages you to wander, pieces range a variety of price points. Khaki’s, casual shirts, swanky hats, shorts, t-shirts and belts share space with evening clothes, ties, shaving accessories and gym bags. 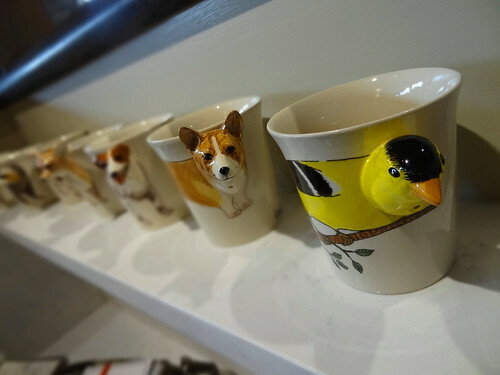 The owner has a great eye. 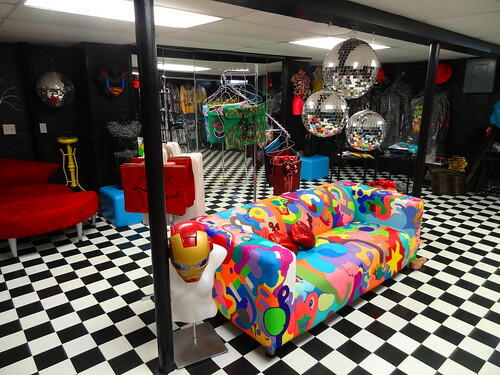 Definitely a place to keep in mind next time Kris updates his closet. 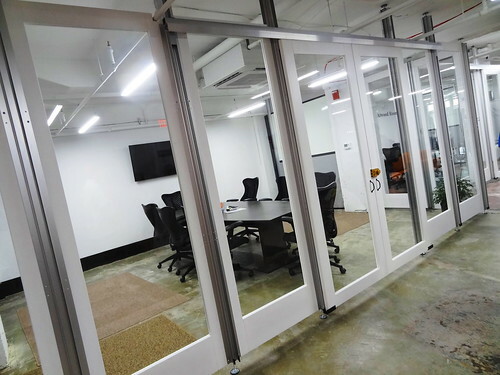 The Happier Camper has an indoor showroom tucked away on Beech Street, a block or so off of Michigan Ave. We don’t camp but curiosity has gotten the best of us and we want to check out the trailers. We receive a warm welcome when we walk in the door, a campground scene is set up before us. 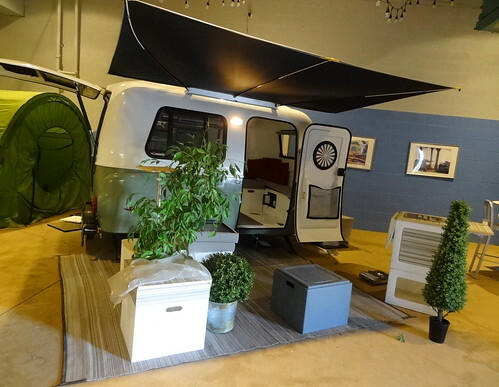 A cute little trailer in white and fern green is on display, doors are open for easy access, modular pieces from the camper are laid out on a floor cloth. 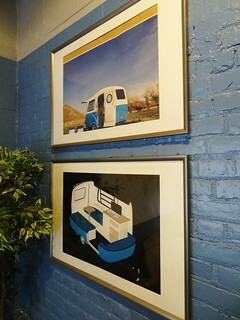 Happier Camper makes vintage-looking trailers with a modern, modular design. You can configure and reconfigure the modular interior system to suit your needs from camping to hauling to guest quarters; it’s not only cute it’s extremely clever. There’s a large rear hatch that makes loading and unloading a breeze, it can sleep 5 people. You can even upgrade your trailer with a stove top, shower, toilet, awning and 100 watt solar panel.All of the camper parts are made in the US–nice. 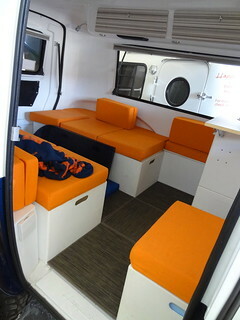 Out in the loading area we take a peek at a Detroit Tiger’s themed unit, orange and navy blue with a Tiger’s logo. The colorful mural on the wall is pretty cool too. Click on the link above and watch the video on their website, looks like fun doesn’t it? Motor City Wine isn’t exactly a new business but it is a nice way to end the day. 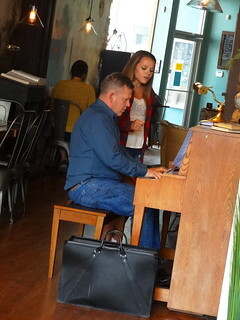 Part wine shop, part wine bar, live Jazz, DJ’s and a patio make MCW a popular place to hang out. The unassuming exterior gives way to a long bar, surprisingly busy; corks decorate the wall behind the back bar. A hand-written menu tells you today’s selections. In addition to wine they have a pretty good beer list and spirits. Hungry? Snack on Marcona almonds, potato chips, olives or how about a cheese or charcuterie plate? Kris and I order sangria’s at the bar, tables are laid out near the u-shaped retail section, we have this area to ourselves. 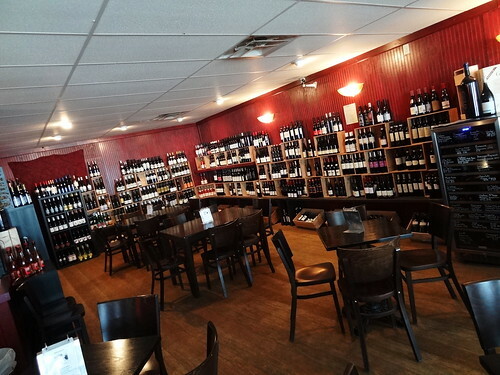 I sip my sangria as I browse the wine selection from all over the world. 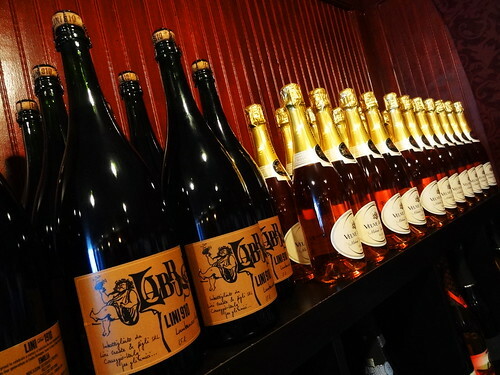 You can purchase a bottle and drink it here for an $8 corkage fee. Our glasses are empty, must be time to go home.